Seahawks general manager John Schneider said that re-signing quarterback Russell Wilson is going to take some work and could present “challenges” concerning constructing a roster moving forward. Seattle Seahawks general manager John Schneider said that re-signing quarterback Russell Wilson could present “challenges” concerning constructing a roster moving forward. Wilson was paid $662,434 in 2014, the third season of a four-year rookie deal. He is scheduled to make $798,651 next season before hitting the free-agent market in 2016. 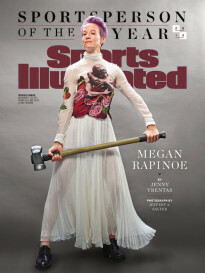 “It presents challenges, there is no question,” Schneider said to the Seattle Times. “We haven’t sat down with his representatives." Schneider said the move may hinder the team's ability to sign coveted free agents. “…The fact that we’re going to continue to keep drafted players and playing young players should help us compensate for whatever level of compensation [Wilson’s contract] is.” Schneider said. He added that the team did a poor job with its free-agency planning last season, but the staff has been proactive in seeing how the rest of the league views its players who are scheduled to become free agents. More than 20 players on Seattle's roster this year are scheduled to hit the market at season’s end. As for Wilson, he is expected to receive an extension that could pay him more than $20 million per season. Wilson, a two-time Super Bowl quarterback, has thrown 72 touchdowns and 26 interceptions in his first three seasons. He has won 40 regular season games, setting an NFL record for most victories by quarterback in his first three years in the league. The Green Bay Packers played the Kansas City Chiefs in the first AFL-NFL World Championship Game, known retroactively as Super Bowl I. Despite ticket prices of $6, $10, and $12, more than 30,000 seats at the Los Angeles Coliseum went empty for the “world championship.” It was the only Super Bowl to not sell out. Green Bay won 35-10. 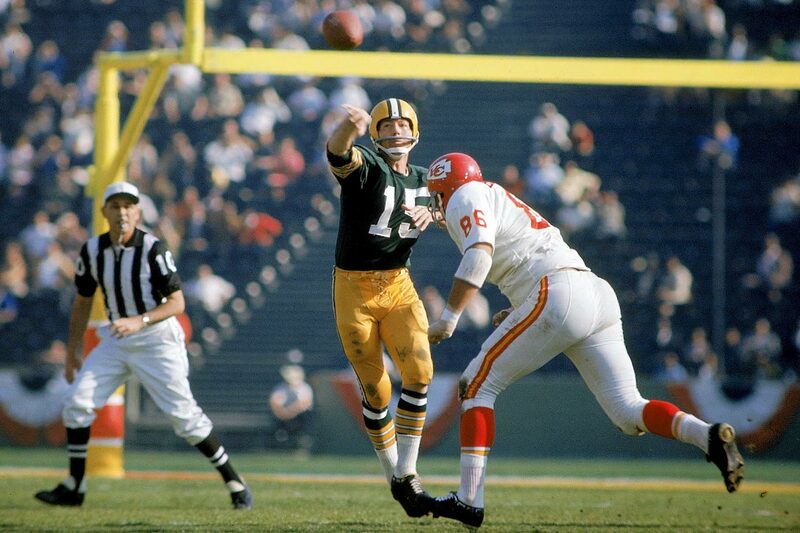 Green Bay Packers quarterback Bart Starr lofts a pass in the first meeting of AFL and NFL champions, played Jan. 15, 1967. Starr's 250 yards passing and two touchdowns earned him Super Bowl MVP. 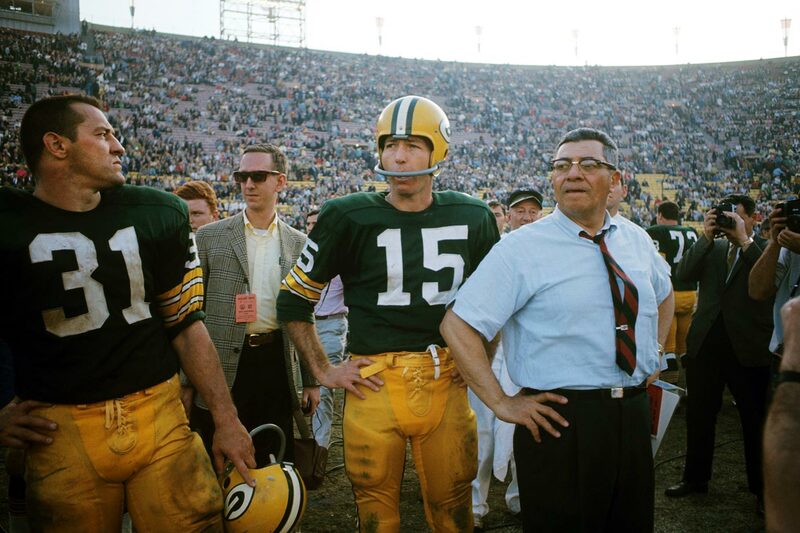 Quaterback Bart Starr and head coach Vince Lombard look on as their Green Bay Packers defeat the Kansas City Chiefs 35-10. After a close first half, the Packers scored 21 consecutive points to run away with the game. 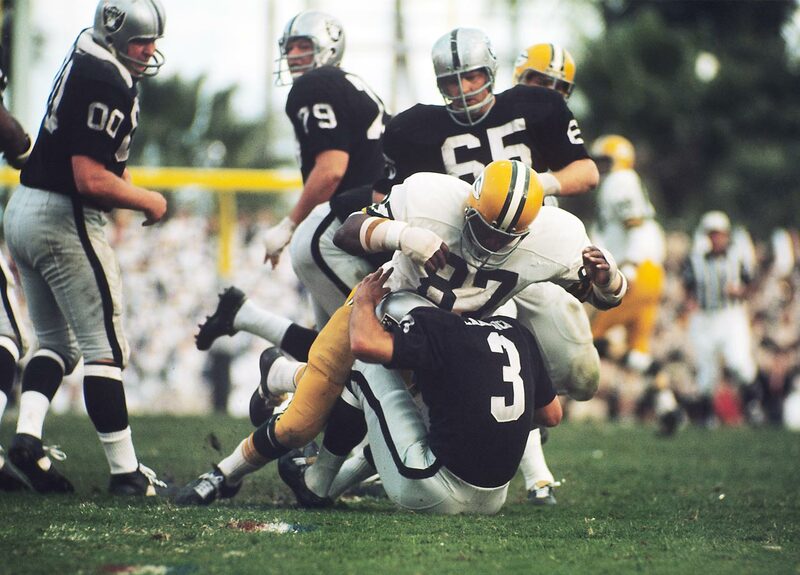 Green Bay Packers defensive end Willie Davis takes down Oakland Raiders quarterback Daryle Lamonica for a sack. The Packers' staunch defense limited the Raiders to 293 yards of offense in Green Bay's 33-14 win. Green Bay Packers guard Jerry Kramer and tackle Forrest Gregg carry head coach Vince Lombardi off the field after their 33-14 win over the Oakland Raiders. 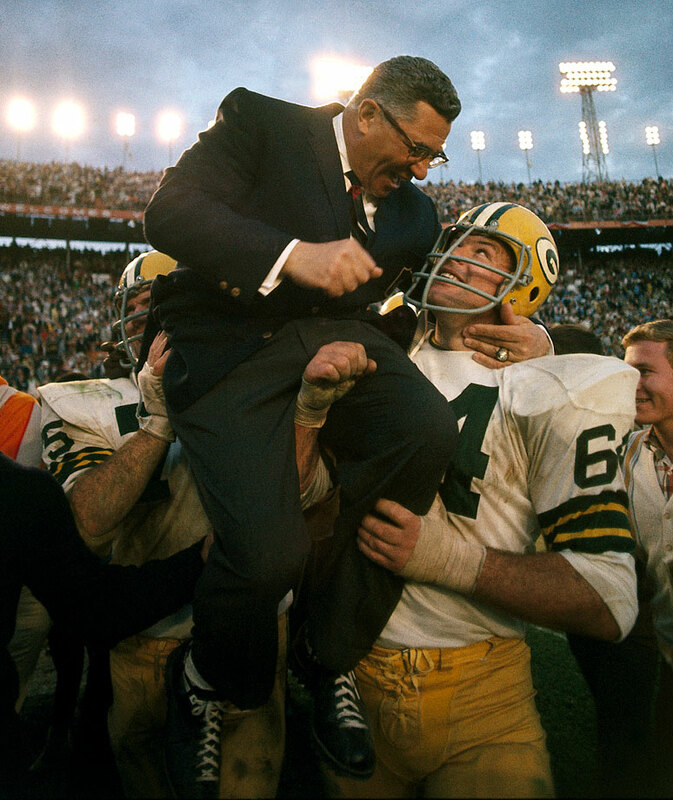 The victory, Green Bay's second straight Super Bowl triumph, was Lombardi's final game as the Packers' coach. New York Jets quarterback Joe Namath looks to pass against the Baltimore Colts. Broadway Joe's team backed up his victory guarantee as New York upset the heavily favored Colts 16-7. Namath completed 17 of 28 passes for 206 yards and was named Super Bowl MVP. 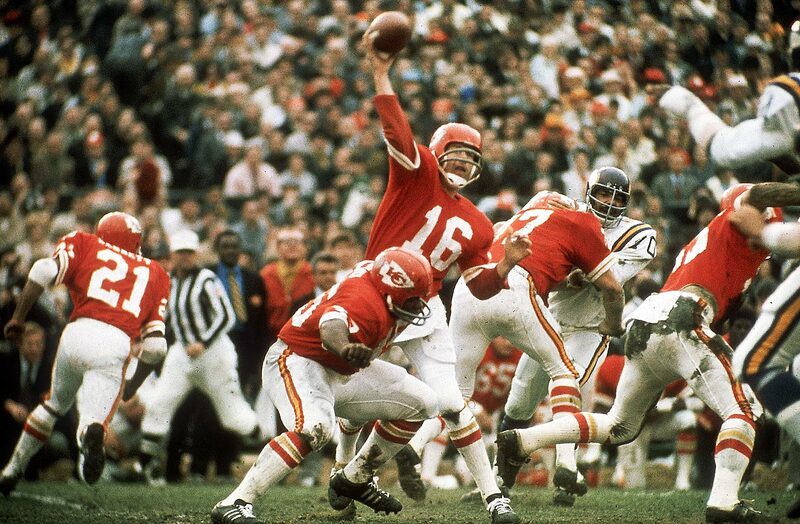 Kansas City Chiefs quarterback Len Dawson throws a pass against the Minnesota Vikings in the last meeting of AFL and NFL champions before the two leagues merged after the season. Dawson earned Super Bowl MVP honors after completing 12 of 17 passes for 142 yards and a touchdown in Kansas City's 23-7 victory. 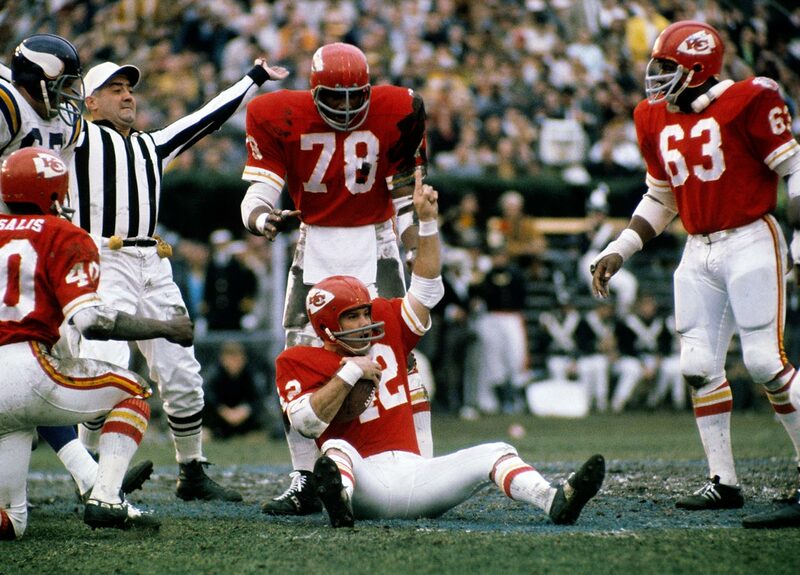 Kansas City Chiefs defensive back Johnny Robinson celebrates after recovering John Henderson's fumble in the second quarter of Super Bowl IV. The Chiefs defense, running a 3-4 scheme unfamiliar to the Minnesota Vikings in the NFL, forced five turnovers to lead Kansas City to a 23-7 victory. Baltimore Colts quarterback Earl Morrall gets a pass off as Dallas Cowboys defensive tackle Bob Lilly bears down on him. 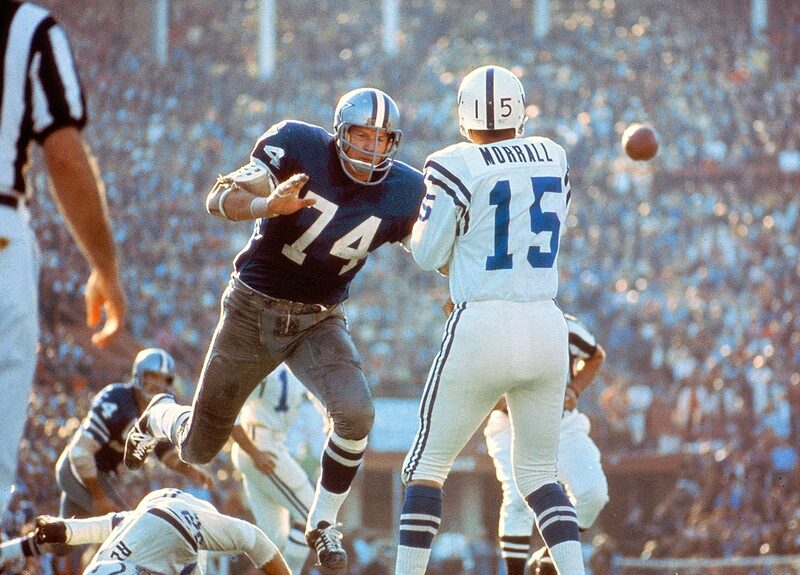 Morrall entered the game only after starting quarterback Johnny Unitas left with a rib injury. Despite completing less than 50 percent of his passes with no touchdowns, Morrall did just enough to guide the Colts to a 16-13 win over the Cowboys. 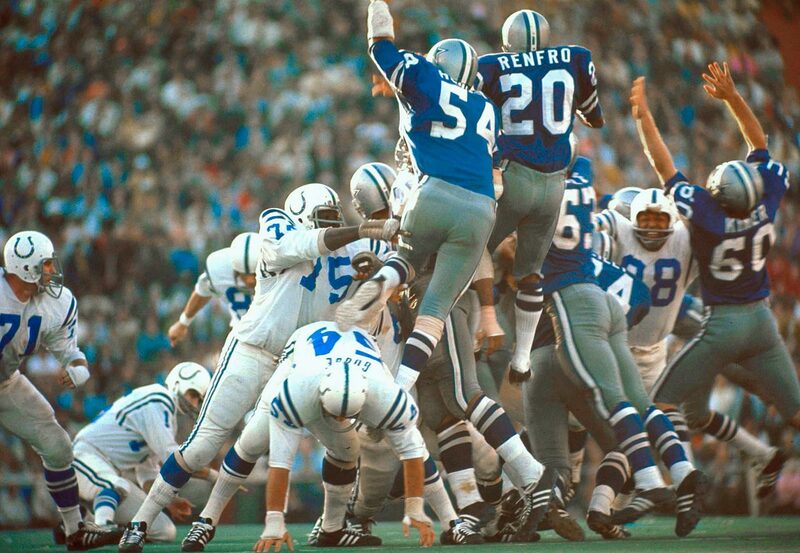 Baltimore Colts rookie kicker Jim O'Brien boots a game-winning field goal with five seconds left over the outstretched arms of the Dallas Cowboys rush. O'Brien's field goal delivered the championship to Baltimore and broke a 13-13 tie. 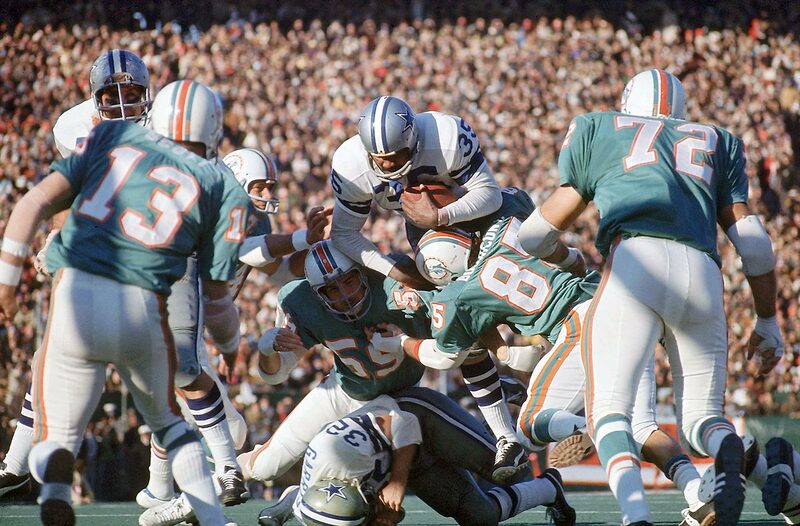 Dallas Cowboys running back Calvin Hill attempts to leap over the pile but gets tackled by the Miami Dolphins defense. The Cowboys dominated on the ground, rushing for a Super Bowl-record 252 yards en route to a 24-3 victory. 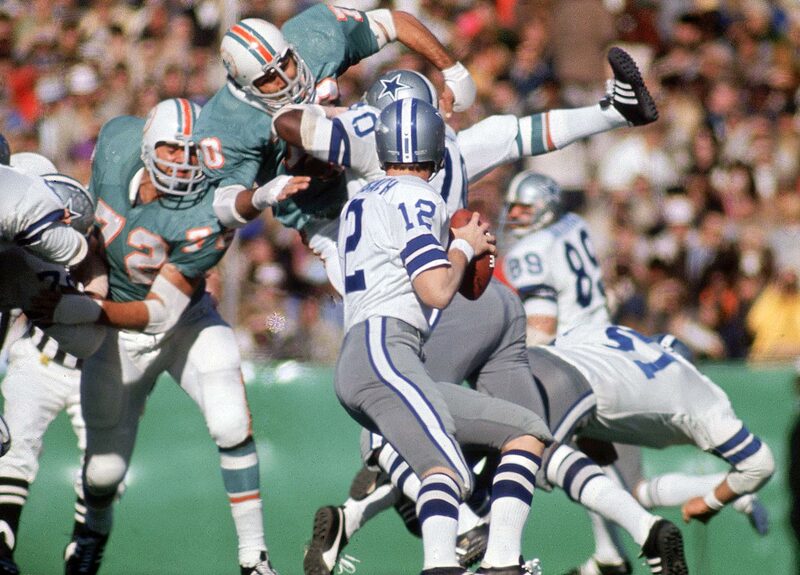 Roger Staubach sets to pass against the Miami Dolphins. Although the Dallas Cowboys quarterback was outdueled by the Dolphins' Bob Griese in passing yards, Staubach claimed the more important victory, snapping the Cowboys' reputation for being unable to win important playoff games. Staubach was named Super Bowl MVP after completing 12 of 19 passes for 119 yards and two touchdowns in the 24-3 win. 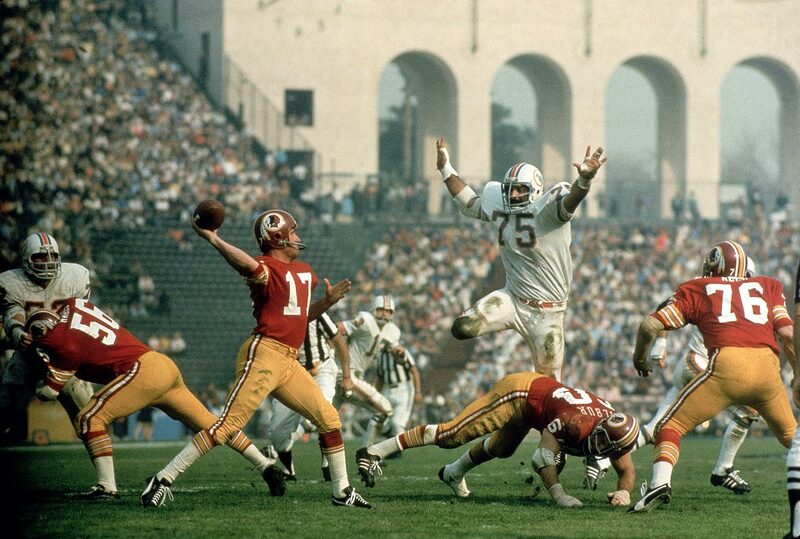 Miami Dolphins defensive tackle Manny Fernandez pursues Washington Redskins quarterback Billy Kilmer, who had three interceptions and no touchdowns against a stingy Miami defense. Washington's only touchdown came on a 49-yard fumble return in the team's 14-7 loss to the Dolphins. 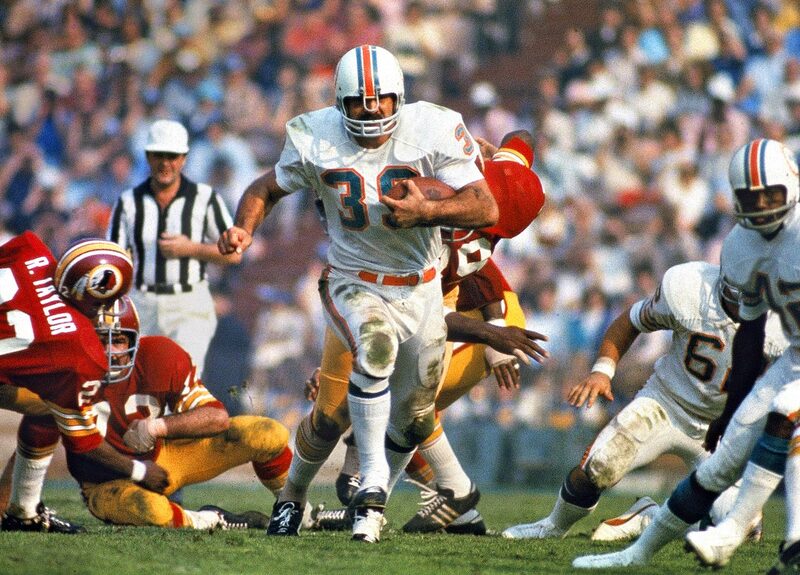 Miami Dolphins fullback Larry Csonka charges up the middle against the Washington Redskins. Csonka tallied 112 yards rushing on 15 carries to lead all rushers and spark Miami's 14-7 triumph. 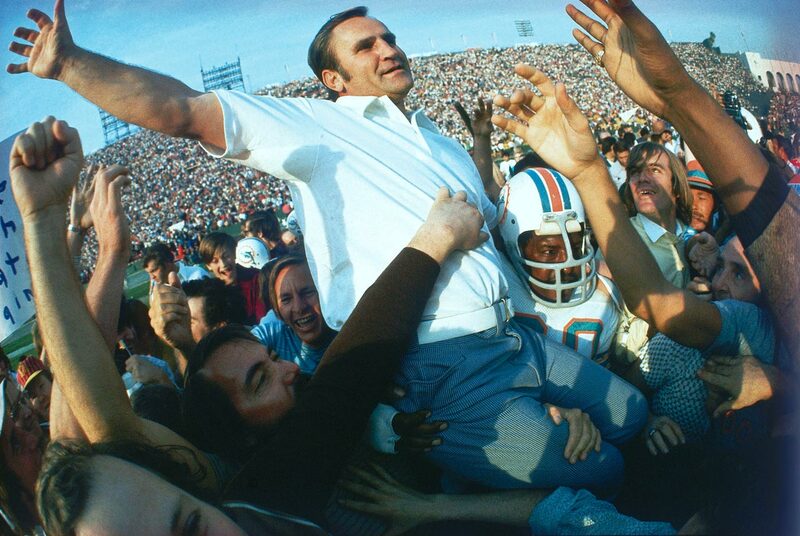 The Miami Dolphins carry head coach Don Shula off the field after defeating the Washington Redskins 14-7. The win capped off the Dolphins' undefeated season, still unmatched in NFL history, and gave Shula his first Super Bowl victory after losing Super Bowls III and VI. 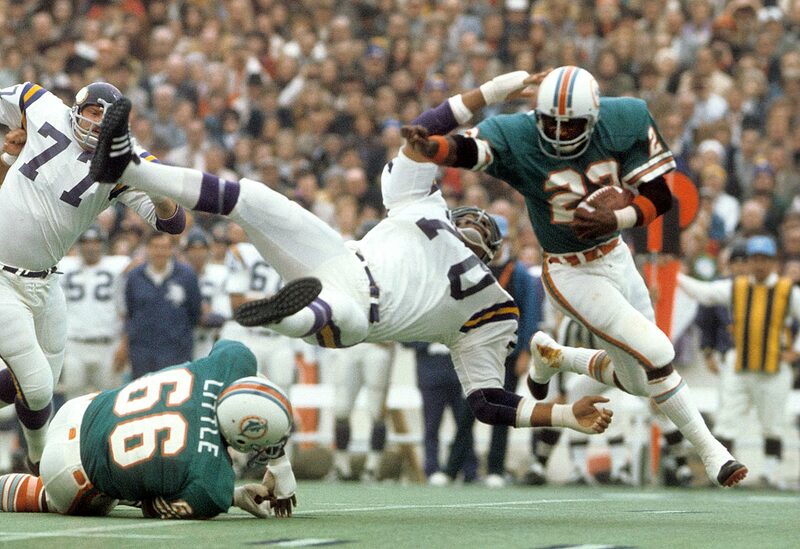 Miami Dolphins running back Mercury Morris breaks a tackle on a carry to the outside. Morris provided the latter part of the 1-2 punch of Miami's running game in the 24-17 win over Minnesota, spelling Csonka for 11 carries for 34 yards. 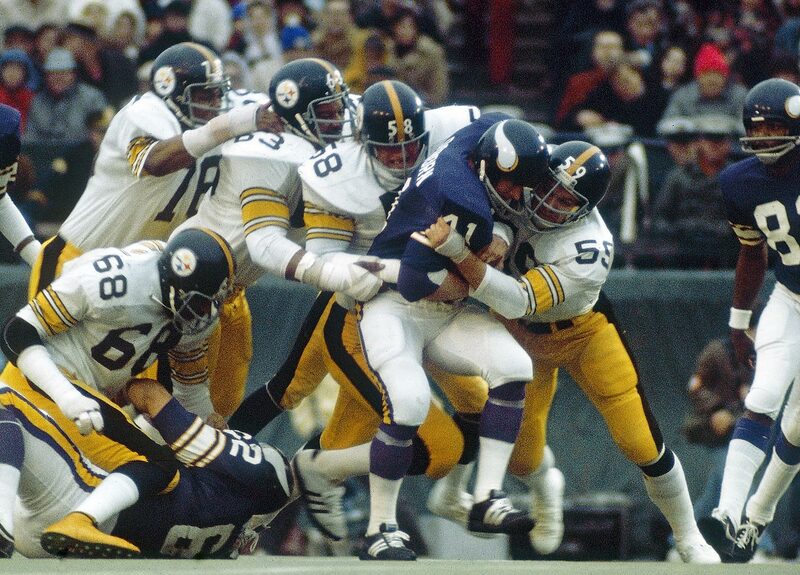 Pittsburgh Steelers linebackers Jack Ham and Jack Lambert, defensive tackle Ernie Holmes and defensive end Dwight White swarm to Minnesota Vikings fullback Dave Osborn. Pittsburgh's Steel Curtain defense contained the Vikings, limiting them to just 119 total offensive yards in pacing a 16-6 win. Pittsburgh Steelers running back Franco Harris and defensive tackle Mean Joe Greene carry their head coach, Chuck Noll, off the field after defeating the Minnesota Vikings 16-6. Harris set a Super Bowl record with 158 rushing yards as he earned Super Bowl MVP honors. Pittsburgh Steelers wide receiver Lynn Swann makes a diving catch over Dallas Cowboys cornerback Mark Washington. Swann was named Super Bowl MVP after catching four balls for 161 yards and a touchdown in Pittsburgh's 21-17 win over the Cowboys. 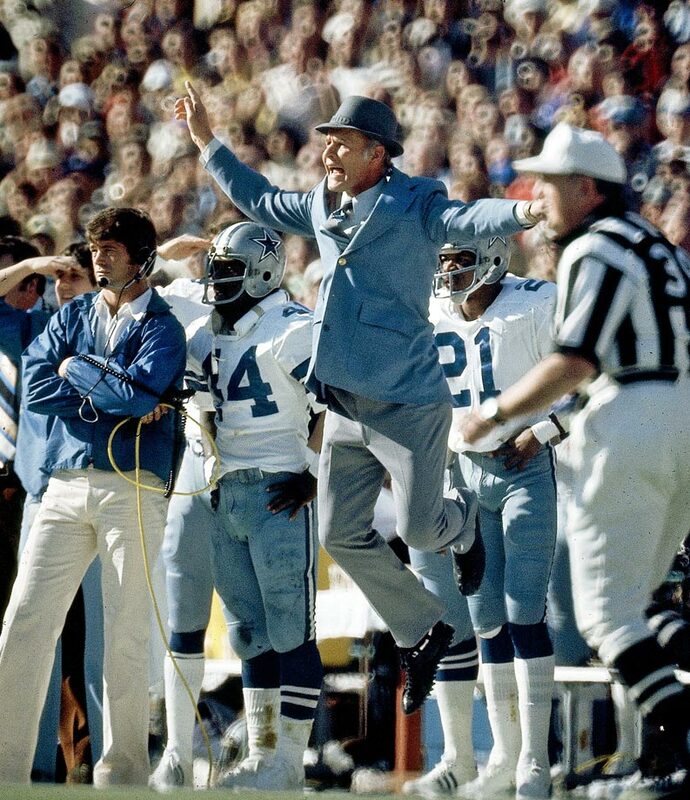 An upset Tom Landry shows some uncharacteristic emotion on the sideline. Landry's Dallas Cowboys were the first wild card team to reach the Super Bowl, beating the Minnesota Vikings on a late Hail Mary and destroying the Los Angeles Rams 37-7 in the NFC Championship Game. They lost to the Steelers in this Super Bowl, 21-17. Pittsburgh Steelers defensive end L.C. Greenwood takes down Dallas Cowboys quarterback Roger Staubach. The Steelers' intimidating defense forced Staubach into three interceptions and sacked him seven times during Pittsburgh's 21-17 win. 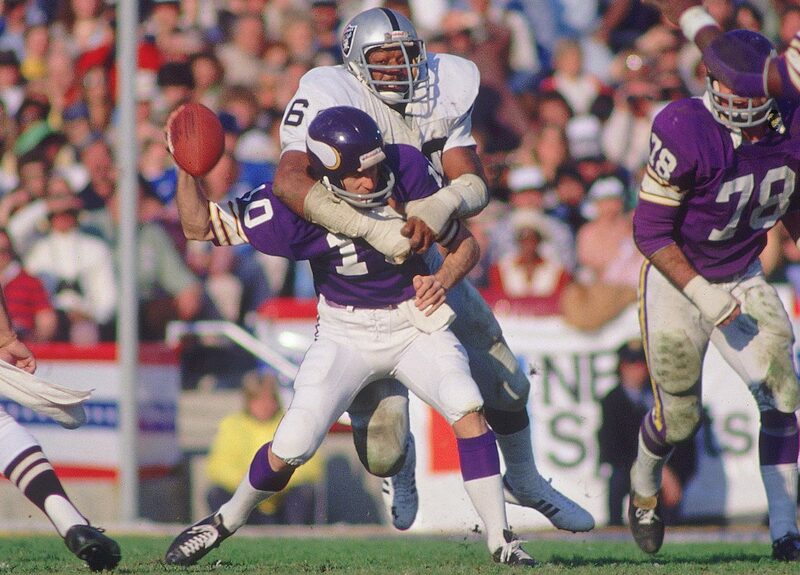 Oakland Raiders defensive end Otis Sistrunk sacks Fran Tarkenton, forcing the Minnesota Vikings quarterback to fumble. Oakland's offense had a field day with the Vikings, setting a Super Bowl record with 429 yards of offense in the 32-14 win. 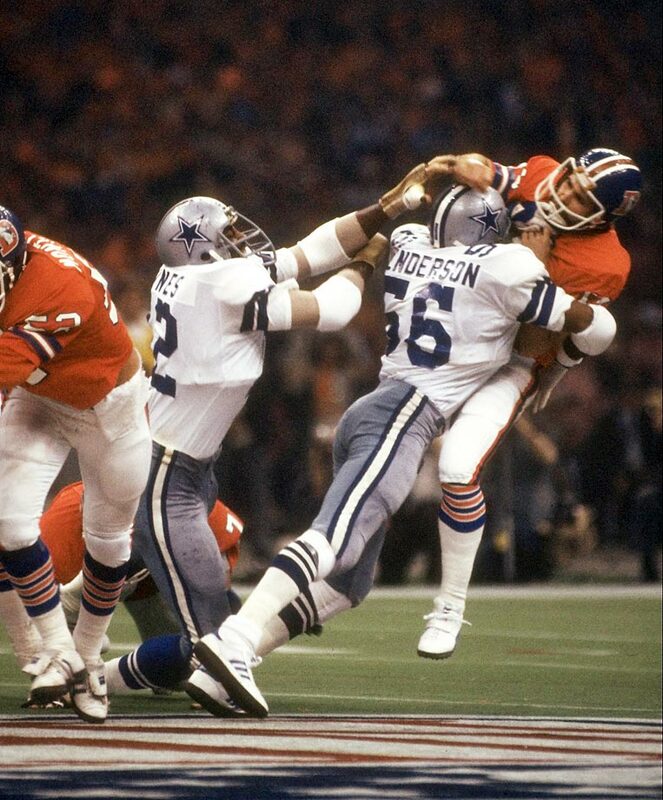 Dallas Cowboys linebacker Thomas Henderson drives Denver Broncos quarterback Norris Weese to the turf. The Cowboys defense ruled the day in New Orleans, forcing eight turnovers and allowing just eight pass completions as Dallas defeated Denver 27-10. Rookie Tony Dorsett cuts away from a Denver Broncos defender. The Dallas Cowboys running back led all rushers in the game with 66 yards on the ground and a first-quarter touchdown. Dorsett became the first player to win an NCAA championship and a Super Bowl title in back-to-back years in the Cowboys' 27-10 victory. Dallas Cowboys defensive end Harvey Martin celebrates with his arm around teammate defensive tackle Randy White after their 27-10 win over the Denver Broncos. The two players both won MVP honors in the game for the first and only time in Super Bowl history. 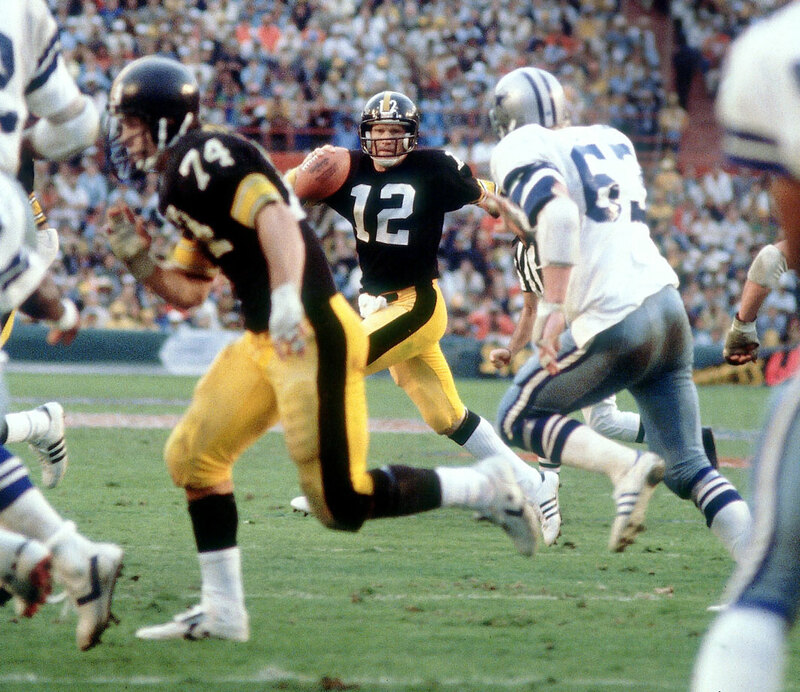 Pittsburgh Steelers quarterback Terry Bradshaw scrambles away from the Dallas Cowboys defense before tossing a touchdown pass to Rocky Bleier. Led by Bradshaw's 318 passing yards and four touchdowns, the Steelers won in a shootout, beating the Cowboys 35-31. Dallas is the only team to score 30 or more points and lose a Super Bowl. Rocky Bleier's leaping catch was the Pittsburgh Steelers fullback's only reception of the day but went for a seven-yard touchdown that gave the Steelers a 21-14 lead over the Dallas Cowboys heading into halftime. Pittsburgh won the game, 35-31. Dallas Cowboys tight end Jackie Smith flops in the end zone after dropping what would have been a game-tying touchdown. Dallas had to settle for a field goal en route to losing, 35-31, to the Pittsburgh Steelers. Pittsburgh Steelers defensive tackle Joe Greene leaps as Los Angeles Rams quarterback Vince Ferragamo attempts to get a pass off. Mean Joe starred in his famous Coca-Cola ad during the commercials of the game, a 31-19 Steelers victory. Pittsburgh Steelers wide receiver John Stallworth hauls in a pass from Terry Bradshaw just beyond the outstretched fingers of Los Angeles Rams cornerback Rod Perry. Stallworth took the pass 73 yards to the end zone to give the Steelers the lead for good in their 31-19 win. Super Bowl MVP Jim Plunkett looks to pass against Philadelphia Eagles defensive end Dennis Harrison.The Oakland Raiders quarterback threw for 261 yards on 13-of-21 passing with three touchdowns to guide the Raiders to a 27-10 victory. 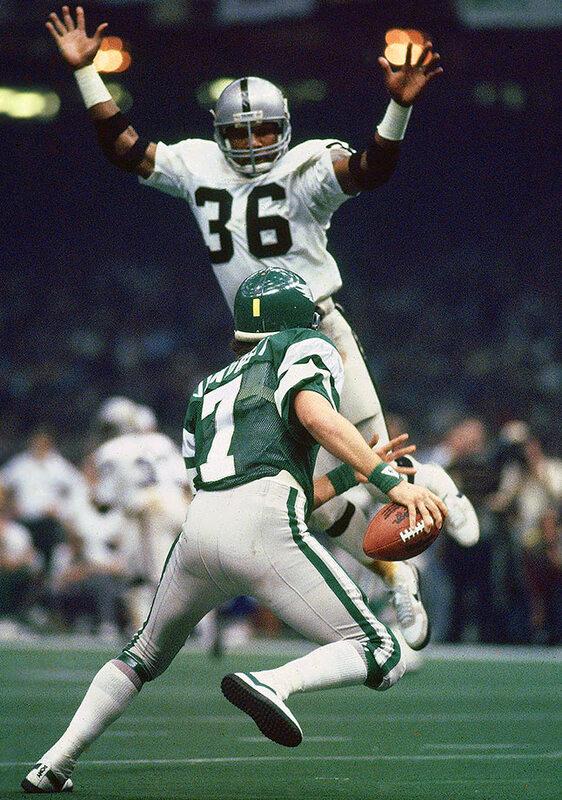 Philadelphia Eagles quarterback Ron Jaworski scrambles away from Oakland Raiders defensive back Mike Davis. Oakland defeated Philadelphia 27-10 as Jaworski completed less than half of his pass attempts with three interceptions. San Francisco 49ers tight end Charles Young hangs on to a pass while being sandwiched between linebacker Jim LeClair and another Cincinnati Bengals defender. Young's grab went for a gain of 14 yards and helped set up the 49ers' first score in their 26-21 victory. San Francisco 49ers fullback Earl Cooper celebrates after scoring a 10-yard receiving touchdown in the second quarter while Cincinnati Bengals cornerback Lewis Breeden looks on from the ground. Cooper's touchdown gave the Niners a 14-0 lead as they went on to win 26-21. 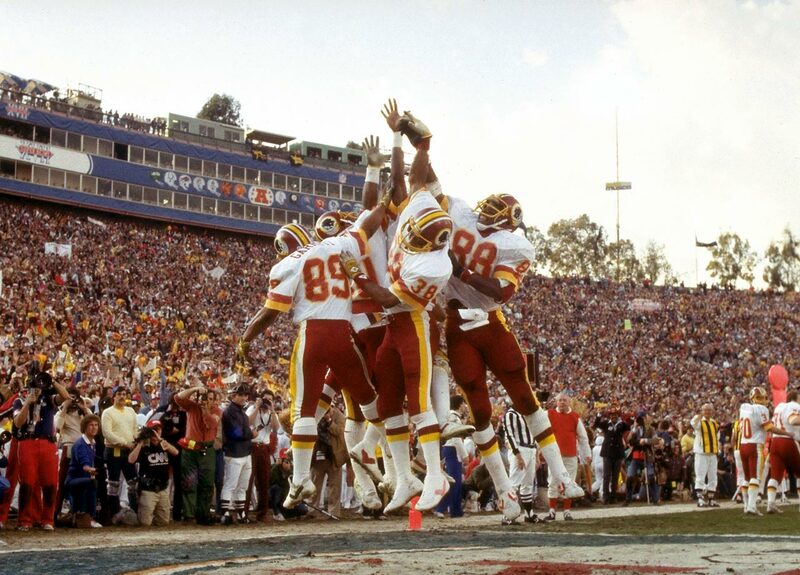 The Washington Redskins "Smurfs" — a group of receivers considered to be "undersized" — celebrate with running back Clarence Harmon and tight end Rick Walker after a touchdown. Washington scored 17 consecutive points in the second half to defeat the Miami Dolphins 27-17. 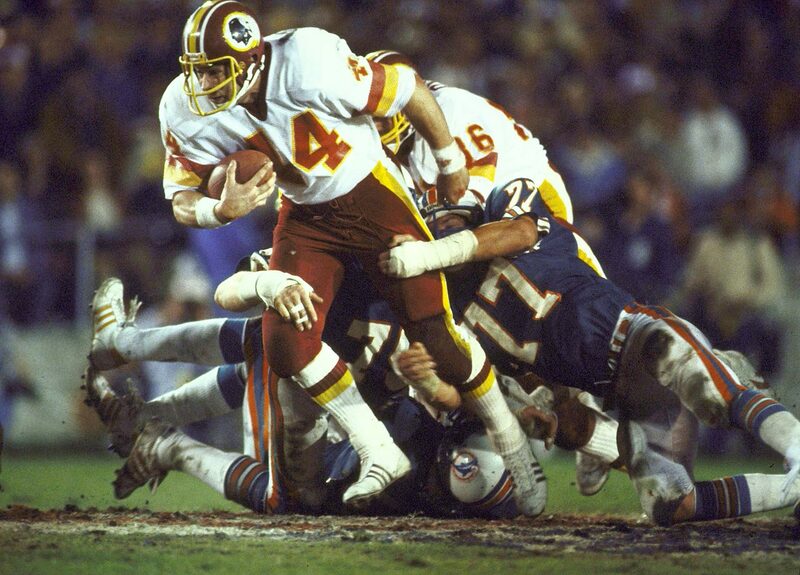 Washington Redskins running back John Riggins powers his way through Miami Dolphins tacklers. Riggins outgained the entire Miami offense with 181 total yards, 166 of them on the ground in the 27-17 win. With his team trailing 17-13 in the fourth quarter, Riggins came up huge on a crucial fourth-and-one, taking the ball 43 yards to the end zone. Jack Squirek raises the ball in triumph after intercepting Washington Redskins quarterback Joe Theismann for a touchdown en route to a 38-9 win for L.A. The Los Angeles Raiders linebacker jumped Theismann's screen pass after the Redskins had run the same play for a 67-yard gain in the team's regular season meeting. 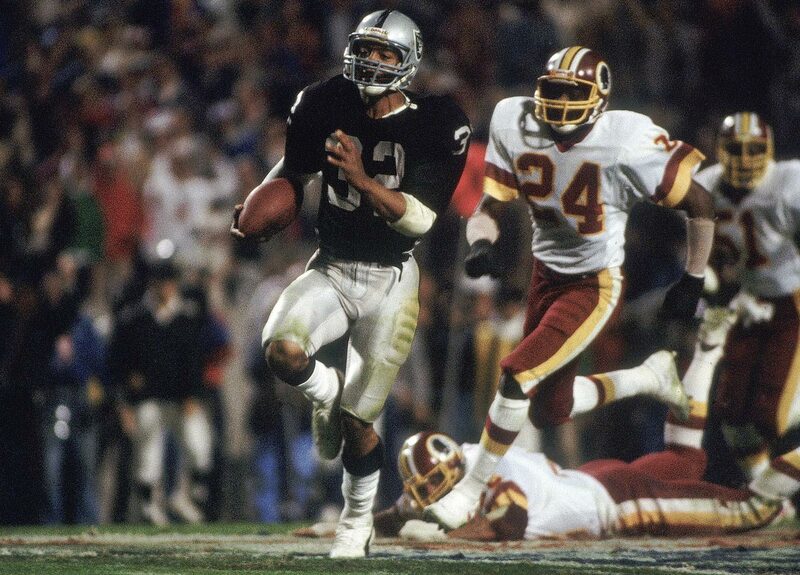 Los Angeles Raiders running back Marcus Allen races away from Anthony Washington and the rest of the Washington Redskins defense for a 74-yard touchdown in the third quarter of a 38-9 blowout. 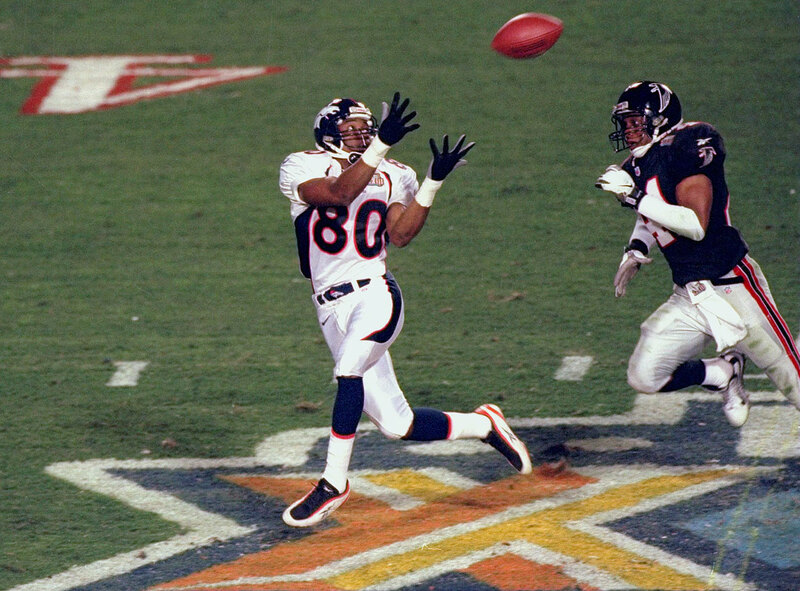 Allen's run was the longest in Super Bowl history at the time. 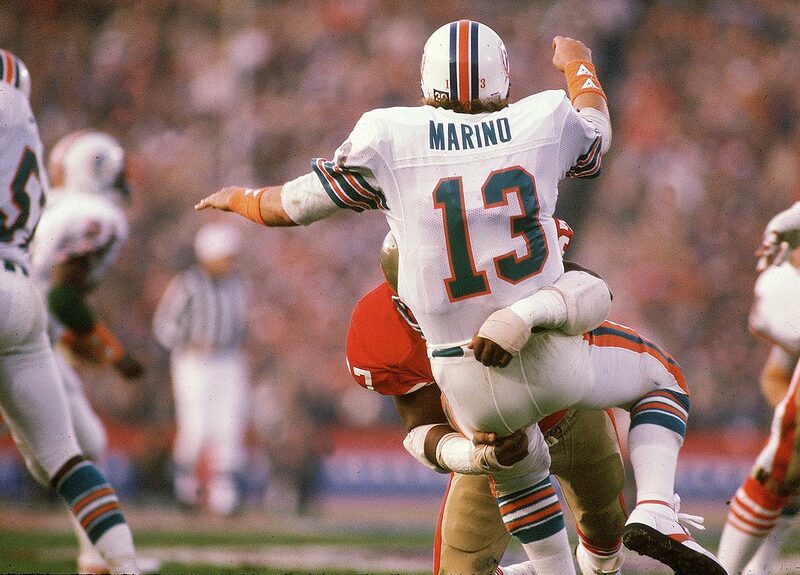 Miami Dolphins quarterback Dan Marino absorbs a big hit from San Francisco 49ers defensive tackle Gary Johnson. Marino completed 29 of 50 passes for 318 yards and a touchdown but his Dolphins fell 38-16. 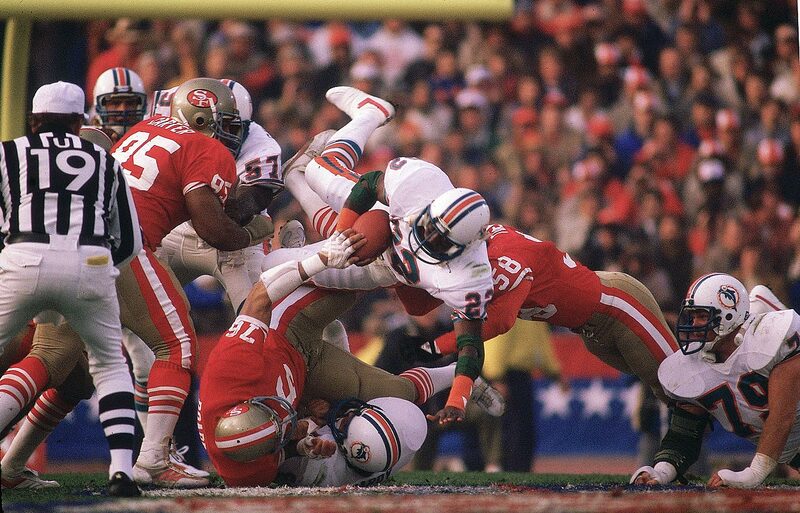 Miami Dolphins running back Tony Nathan dives on top the San Francisco 49ers defense. Nathan had limited success running the ball in the 38-16 loss, gaining just 18 yards on the ground. He did pick up 83 receiving yards on 10 catches. 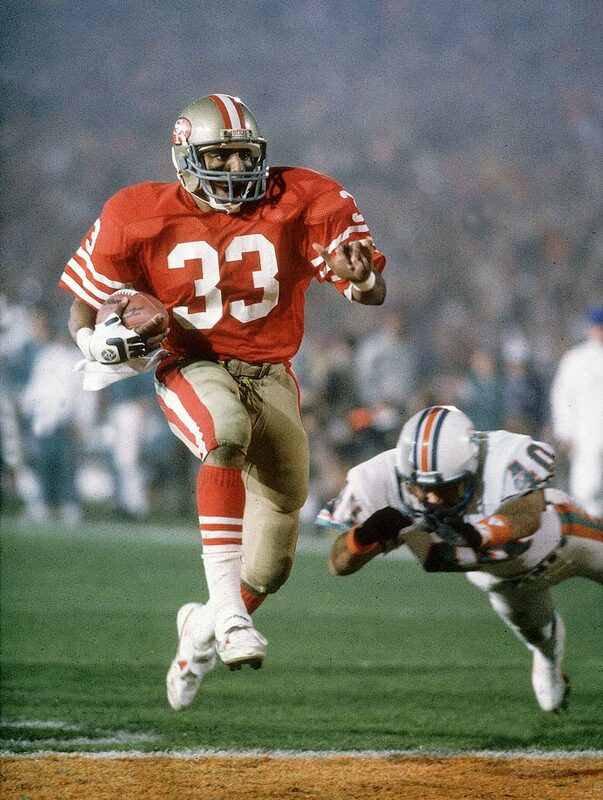 San Francisco 49ers running back Roger Craig rushes past diving Miami Dolphins defensive back Mike Kozlowski for a touchdown in his team's 38-16 win. 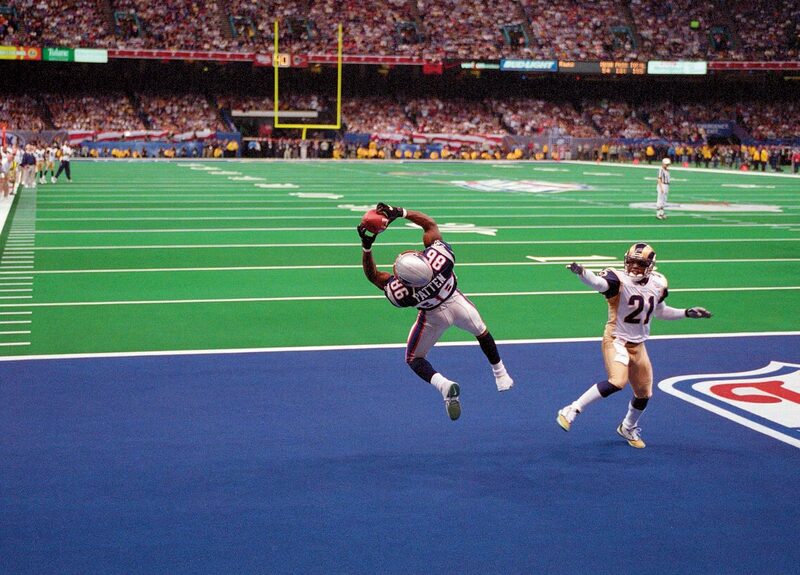 Craig became the first player to score three touchdowns in a Super Bowl, catching two and rushing for a third. 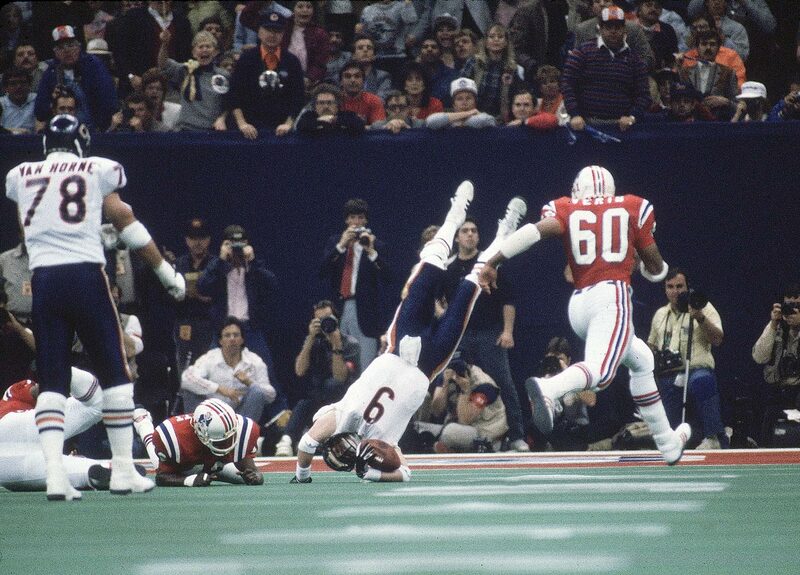 Chicago Bears quarterback Jim McMahon is upended on a scramble by the New England Patriots defense. 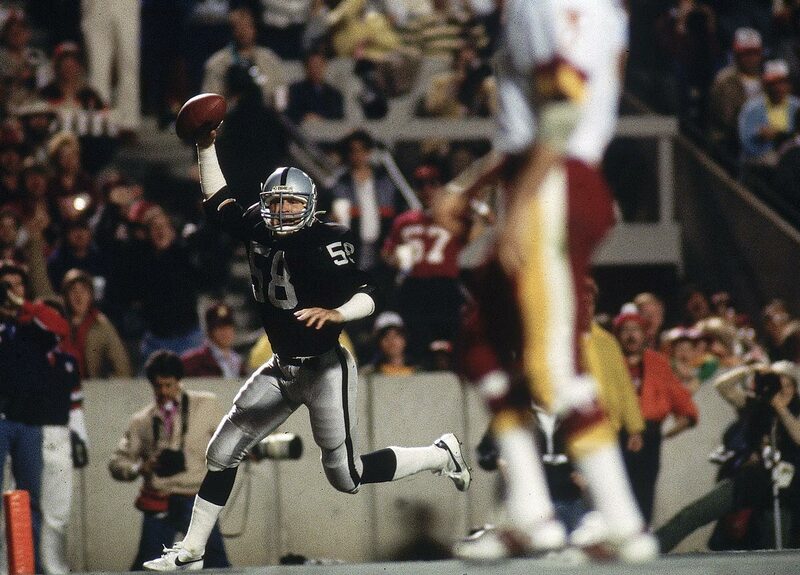 McMahon became the first quarterback to rush for two touchdowns in a Super Bowl; he threw for 256 yards in the 46-10 rout. Chicago Bears quarterback Jim McMahon puts his arm around legendary running back Walter Payton. In the only Super Bowl of Payton's Hall of Fame career, he was held to 61 yards on 22 carries with a fumble. Very little went right for the New England Patriots other than limiting Payton as the Chicago Bears routed New England 46-10. Chicago Bears defensive back Reggie Phillips raises his arms after returning an interception 28 yards for a touchdown against the New England Patriots. The Bears' innovative 46 defense dominated the game, registering seven sacks and allowing just seven rushing yards in the 46-10 win, while directly putting nine points on the board. 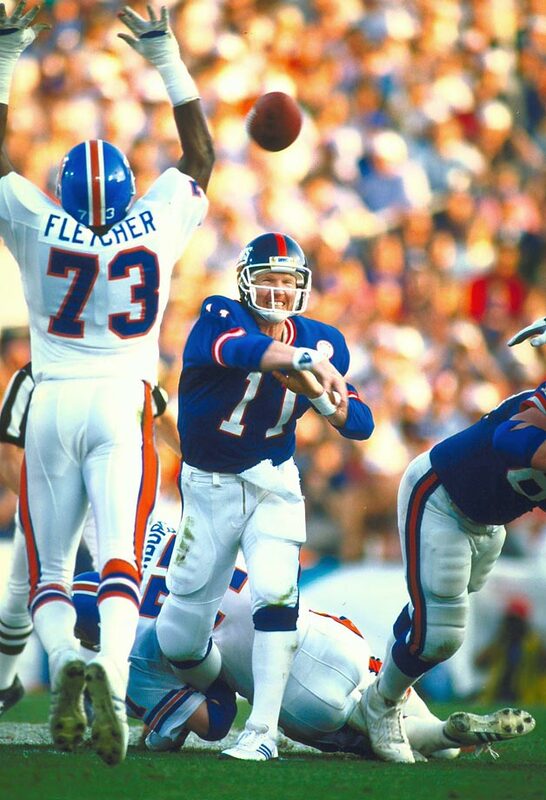 New York Giants quarterback Phil Simms tosses a pass around the outstretched arms of Denver Broncos linebacker Simon Fletcher. Simms carved up the Broncos defense for 268 yards and three touchdowns on 22-of-25 passing as the Giants dominated Denver 39-20. 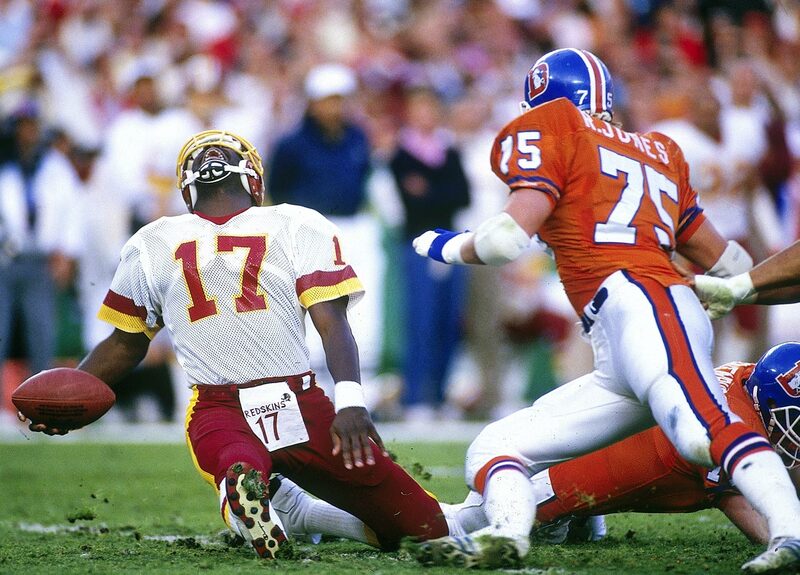 Washington Redskins quarterback Doug Williams twists his leg late in the first quarter, forcing him the leave the game with the Denver Broncos up 10-0. Williams returned to throw for 340 yards and four touchdowns as the Redskins easily defeated the Broncos 42-10. Williams was the first black quarterback to play in the Super Bowl. 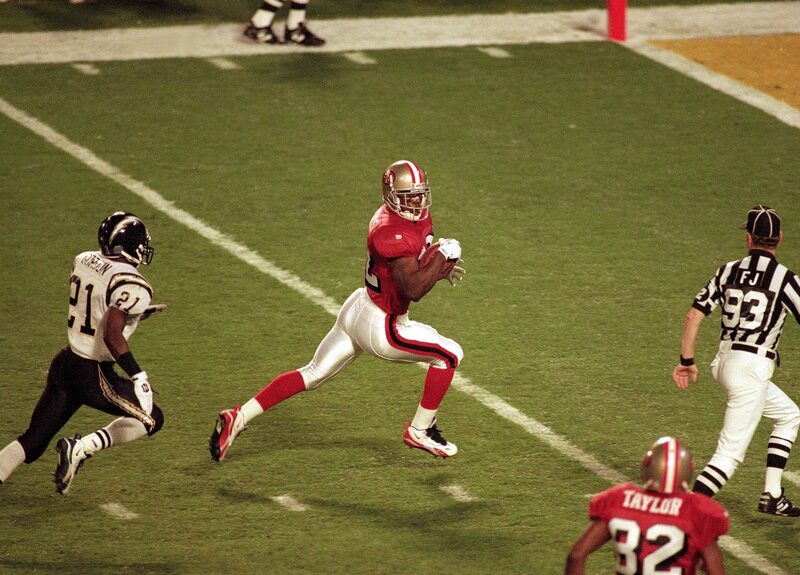 San Francisco 49ers wide receiver Jerry Rice tips a pass to himself to make a one-handed catch. Rice caught 11 passes for 215 yards and a touchdown as he was named MVP in the Niners' 20-16 win over the Cincinnati Bengals. 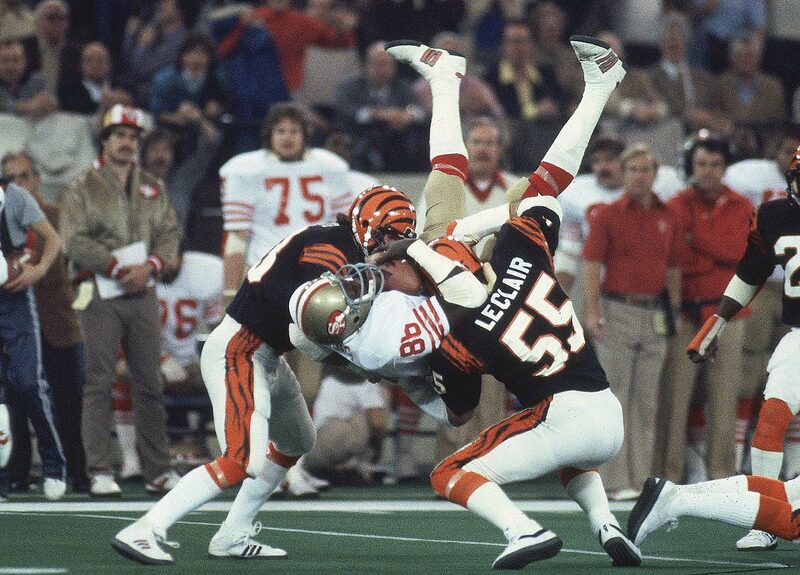 San Francisco 49ers defensive tackle Michael Carter tugs at Boomer Esiason as the Cincinnati Bengals quarterback attempts to pass. The 49ers defense limited Esiason to just 11-of-25 passing and 144 yards with no touchdowns and one interception in San Francisco's 20-16 win. 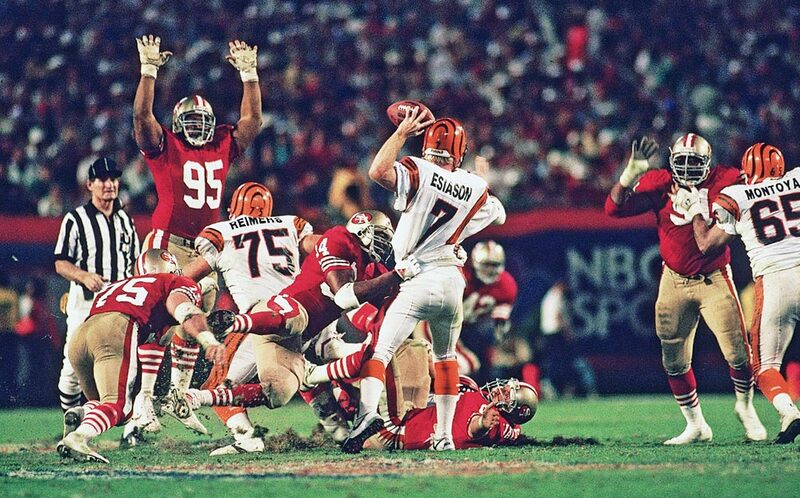 As the Cincinnati Bengals defensive line trudges through the mud to get to him, Joe Montana reaches back to pass. The San Francisco 49ers quarterback threw for 357 yards and two touchdowns, including a game-winning throw to John Taylor with 34 seconds remaining to cap off a 92-yard drive and a 20-16 win. Joe Montana leaps into the air to high-five guard Guy McIntyre as the San Francisco 49ers polish off their second straight Super Bowl victory. The 49ers quarterback was named Super Bowl MVP after completing 22 of 29 passes for 297 yards and five touchdowns. San Francisco cruised to the win, defeating the Denver Broncos 55-10. Buffalo Bills kicker Scott Norwood sends his game-winning field goal attempt wide right, securing the New York Giants' 20-19 victory. 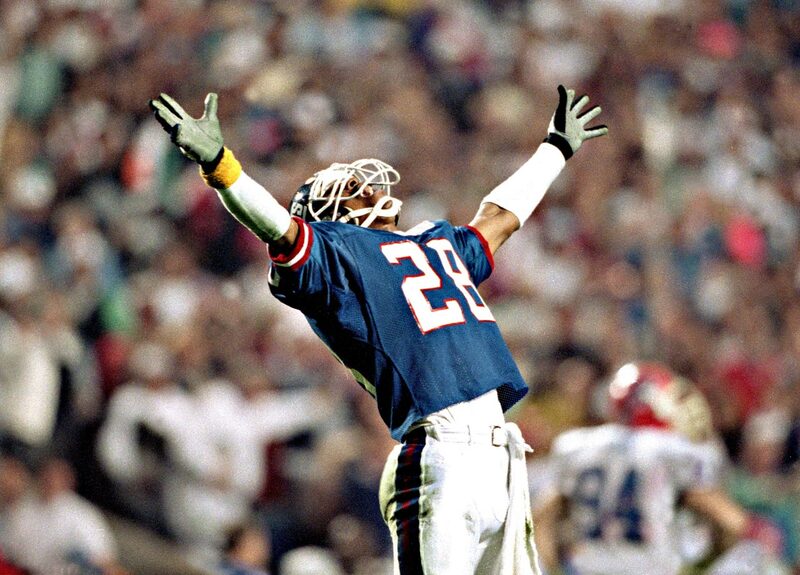 New York Giants defensive back Everson Walls basks in the triumph after his team's 20-19 win over the Buffalo Bills. The Giants overcame a 12-3 deficit to claim the only Super Bowl decided by one point. Art Monk appears to catch a touchdown pass over the head of Buffalo Bills cornerback Kirby Jackson. Although the play was ruled a touchdown on the field, a video review overturned the call when replay revealed the Washington Redskins wide receiver's foot landed out of bounds. 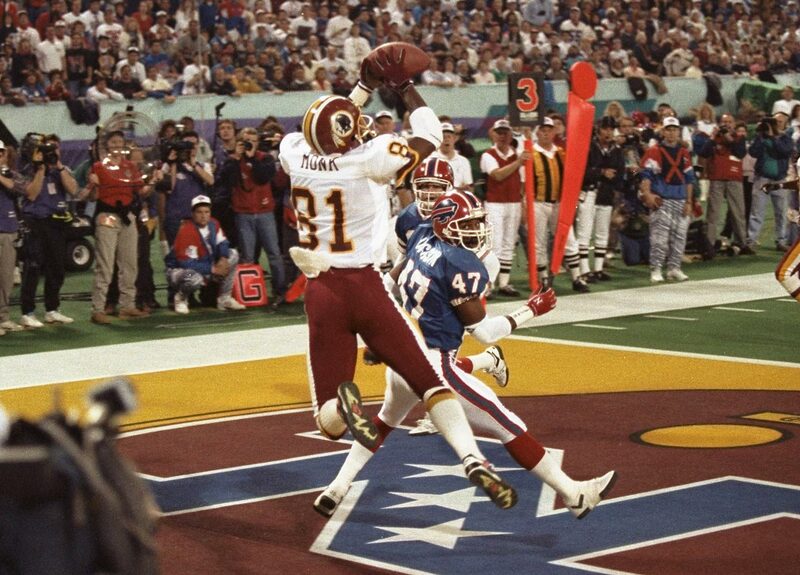 It was the first time a touchdown was overturned by instant replay in a Super Bowl, although the Redskins went on to win 37-24. 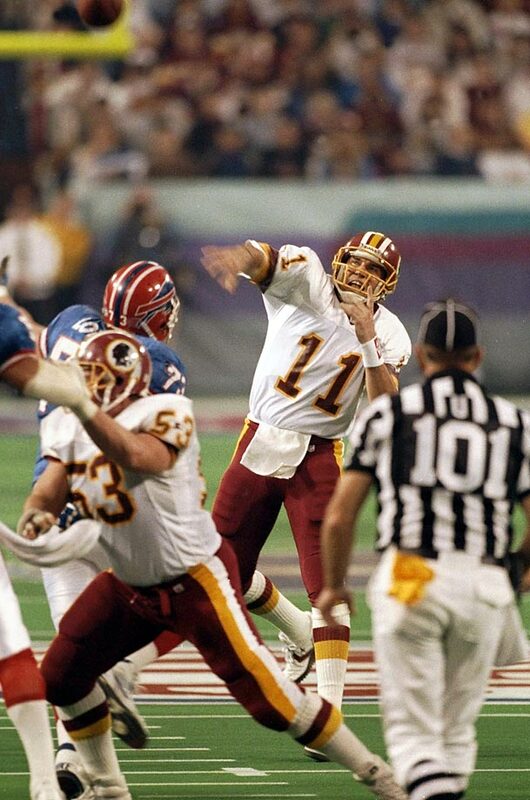 Washington Redskins quarterback Mark Rypien tosses a pass against the Buffalo Bills. Rypien earned Super Bowl MVP honors by throwing for 292 yards and two touchdowns on 18-of-33 passing in the Redskins' 37-24 win. Troy Aikman hurdles a Buffalo Bills defender on a scramble. The Dallas Cowboys quarterback was named Super Bowl MVP after completing 22 of 30 passes for 273 yards and four touchdowns. He also rushed for 28 yards in the 52-17 romp. Dallas Cowboys safety Thomas Everett intercepts a pass from Buffalo Bills quarterback Jim Kelly in the end zone on fourth down. Everett picked off two passes as the Cowboys routed the Bills 52-17. 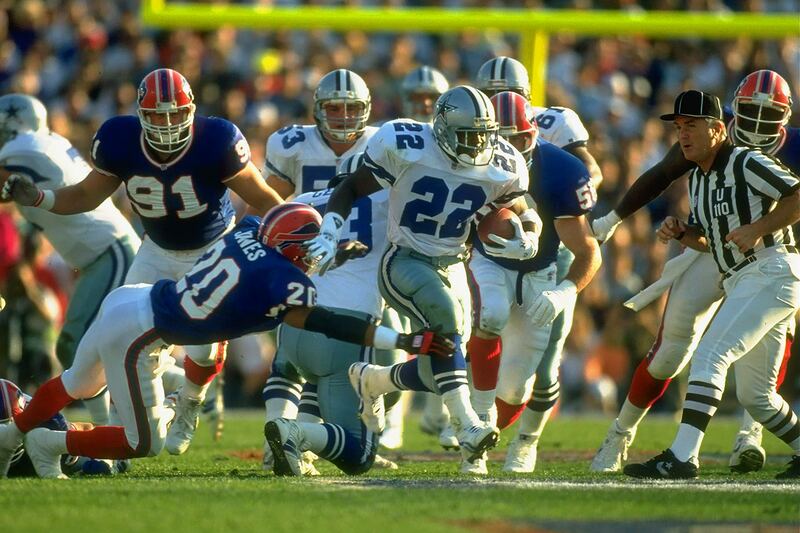 Dallas Cowboys running back Emmitt Smith escapes from Buffalo Bills safety Henry Jones at midfield. Smith led all rushers in the Cowboys 52-17 win, racking up 108 yards on the ground with a touchdown. 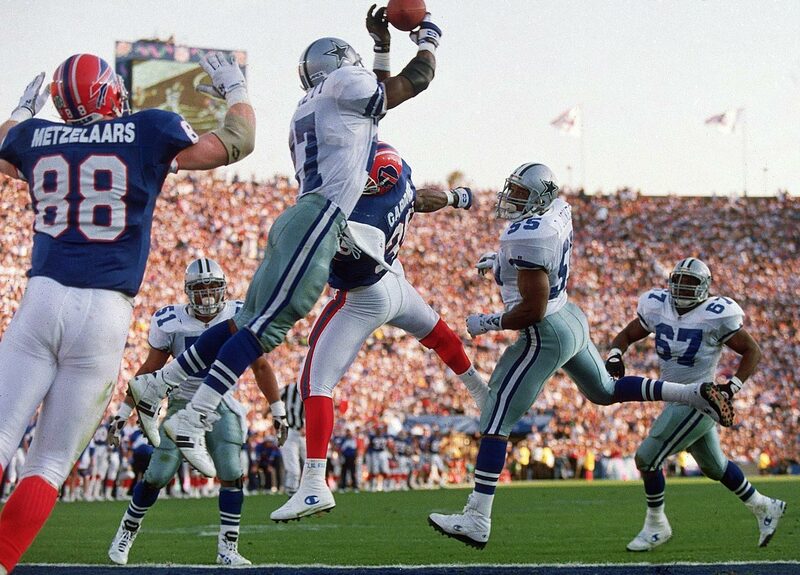 Dallas Cowboys running back Emmitt Smith reacts after scoring a touchdown against the Buffalo Bills. Smith dominated the Bills in a Super Bowl rematch, rushing for 132 yards and two touchdowns. He was named MVP as his team sent the Bills to their fourth straight Super Bowl defeat, 30-13. San Francisco 49ers running back Ricky Watters outpaces San Diego Chargers cornerback Darrien Gordon on a 51-yard touchdown pass from quarterback Steve Young. Watters scored three touchdowns in the Niners' 49-26 win, catching two and rushing for a third. 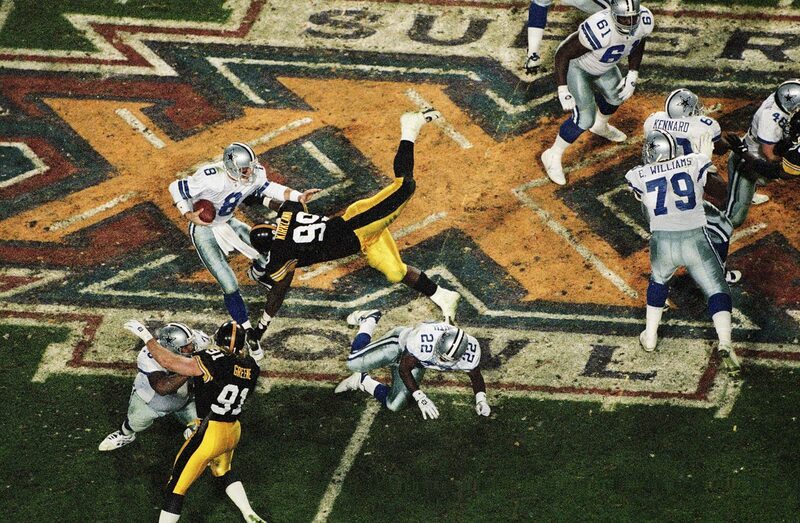 Pittsburgh Steelers linebacker Levon Kirkland dives at the feet of Dallas Cowboys quarterback Troy Aikman. 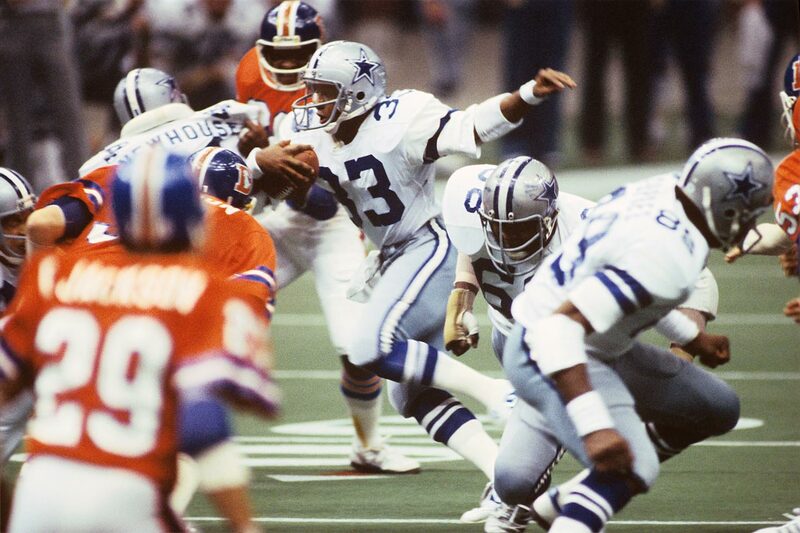 Aikman threw for 209 yards and a touchdown on 15-of-23 passing in the 27-17 victory to become just the third quarterback to win three Super Bowls. Green Bay Packers defensive end Reggie White bears down on Drew Bledsoe as the New England Patriots quarterback attempts to pass. The Green Bay Packers defense badly flustered Bledsoe as he threw four interceptions in the Pats' 35-21 loss. White set a Super Bowl record with three sacks. 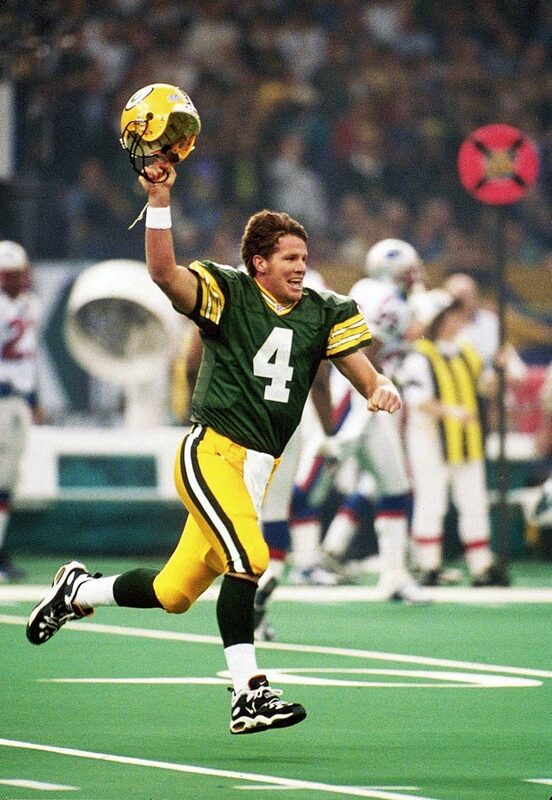 Brett Favre raises his helmet in celebration after throwing a 54-yard touchdown pass to wide receiver Andre Rison in the first quarter. The Green Bay Packers quarterback completed 14 of 27 passes for 246 yards and two touchdowns while rushing for another touchdown in the 35-21 triumph. Denver Broncos quarterback John Elway gets helicoptered on a third-down hit by Green Bay Packers safeties LeRoy Butler and Mike Prior. 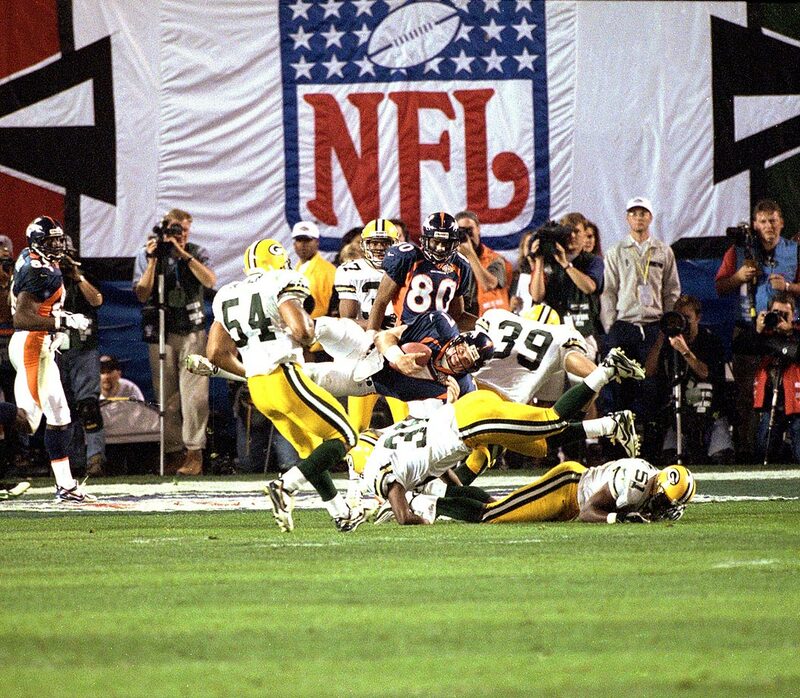 Despite the big hit, Elway picked up a first down on the play, keeping Denver's drive alive for a later Terrell Davis touchdown. That touchdown drive proved crucial in the Broncos' hard-fought 31-24 win. 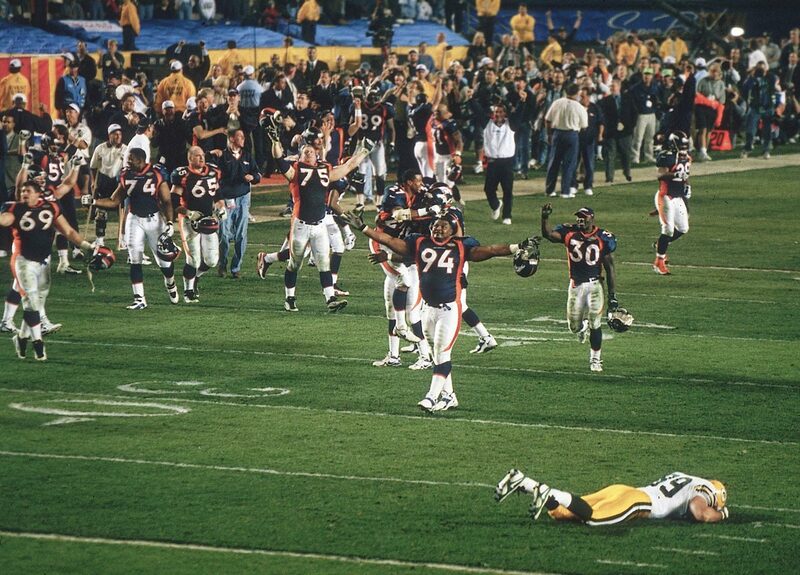 Defensive tackle Keith Traylor, running back Terrell Davis and the Denver Broncos celebrate while Green Bay Packers tight end Mark Chmura lies faced-down on the field after the Broncos' 31-24 victory over the Packers. Denver's win was the first Super Bowl title for the franchise and snapped a 13-game losing streak for AFC teams in the Super Bowl. John Elway raises the Lombardi Trophy after the Denver Broncos' 31-24 triumph over the Green Bay Packers. 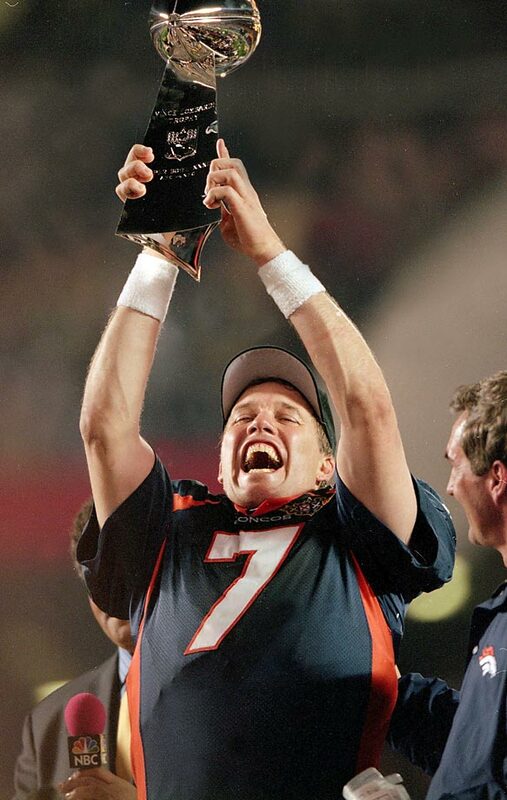 After 15 seasons in the league, the illustrious quarterback finally won his first Super Bowl. Denver Broncos quarterback John Elway passes against the Atlanta Falcons. The 38-year-old Elway became the oldest player to be named Super Bowl MVP, throwing for 336 yards and a touchdown and rushing for another score in Denver's 34-19 win, the final game of his career. Denver Broncos wide receiver Rod Smith awaits a bomb from John Elway after gaining separation from Atlanta Falcons free safety Eugene Robinson. Smith took the ball for an 80-yard touchdown to expand Denver's lead to 14 points in the second quarter. They went on to win 34-19. St. Louis Rams running back Marshall Faulk races down the right sideline after catching a pass from Kurt Warner. The Tennessee Titans held the Rams running back to 17 rushing yards, but Faulk gained 90 yards through the air on five receptions as the Rams won 23-16. Tennessee Titans wide receiver Kevin Dyson was already down at the one before he stretched the ball into the end zone on the final play of a game that his team lost 23-16. At the 10-yard line with six seconds remaining, the Titans tried to reach the end zone, but St. Louis linebacker Mike Jones' tackle kept Dyson short. Jermaine Lewis sprints down the right sideline for an 84-yard kickoff return for a touchdown in the third quarter. The Baltimore Ravens wide receiver's return capped off a dizzying spell of touchdowns in which the Ravens returned an interception and a kickoff for a touchdown and the New York Giants returned a kickoff for a touchdown on three consecutive plays. Baltimore won 34-7. 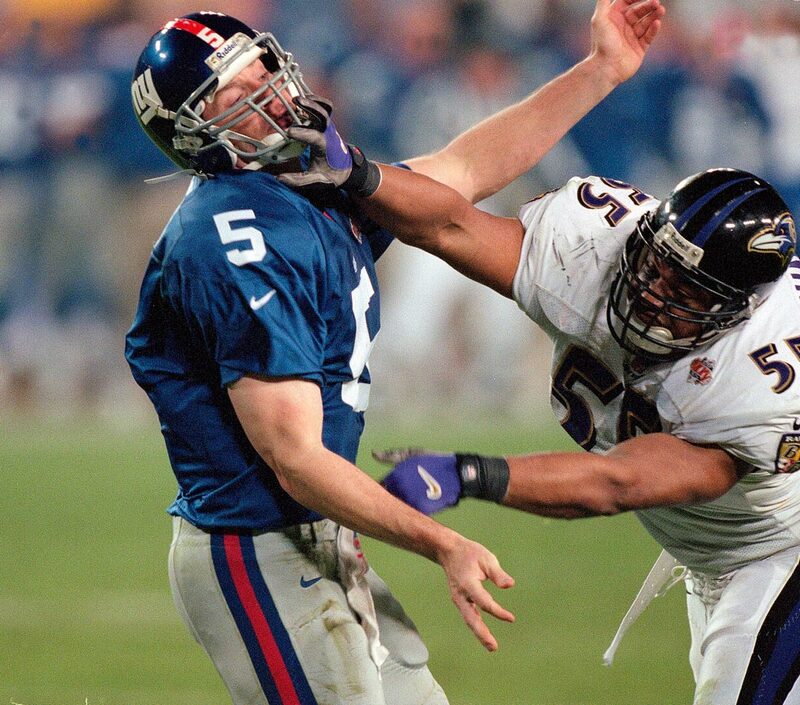 Baltimore Ravens linebacker Jamie Sharper grabs the facemask of New York Giants quarterback Kerry Collins in the fourth quarter. The Ravens defense badgered the Giants all game, recording four sacks and forcing five turnovers to pace a 34-7 victory. 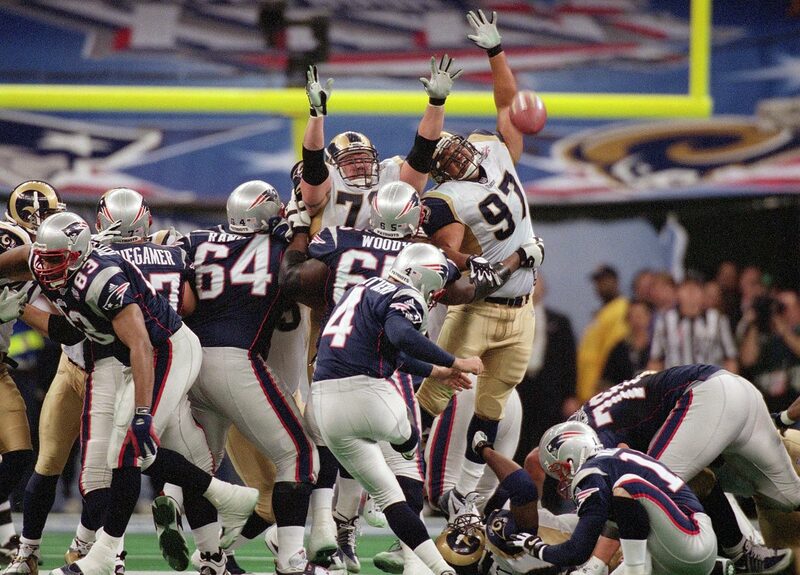 New England Patriots linebacker Willie McGinest crashes into St. Louis Rams quarterback Kurt Warner. 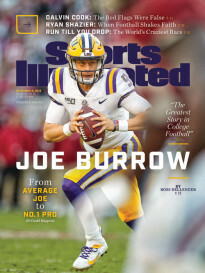 Leading the Greatest Show on Turf offense, Warner threw for 365 yards with two total touchdowns but also tossed two interceptions in the Rams' 20-17 loss. New England Patriots wide receiver David Patten makes an acrobatic catch for a touchdown against the St. Louis Rams in the second quarter. The catch gave the Patriots a 14-3 lead at halftime; they won 20-17. New England Patriots kicker Adam Vinatieri knocks through a game-winning field as the Pats stunned the St. Louis Rams, 20-17. Vinatieri's 48-yarder as time expired came after quarterback Tom Brady led the Patriots down the field with 1:30 left and no timeouts. Tampa Bay defensive tackle Warren Sapp brings down Oakland quarterback Rich Gannon and jars the ball free for a fumble. Although the Raiders recovered the fumble, the Buccaneers' defense controlled the game, scoring three touchdowns on interception returns. Those touchdowns helped Tampa Bay easily prevail 48-21. Tampa Bay Buccaneers wide receiver Joe Jurevicius extends a stiff arm at cornerback Tory James in the Bucs 38-21 victory. 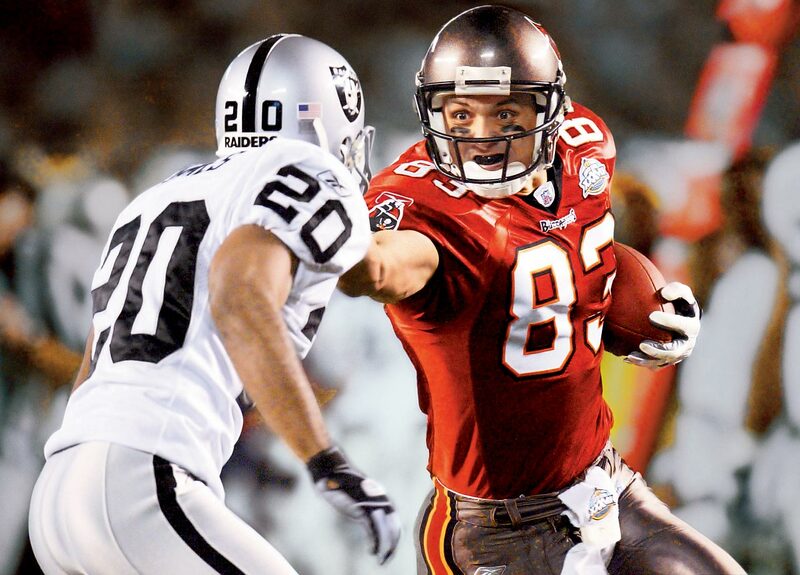 Jurevicius led all receivers with 78 yards on four catches despite playing with the distraction of his infant son, who was born prematurely five days before the NFC Championship and eventually died in March 2003. Quarterback Tom Brady and the New England Patriots rush the field after defeating the Carolina Panthers. Kicker Adam Vinatieri nailed a 41-yard field goal with four seconds remaining to put the Patriots on top 32-29. New England Patriots linebacker and tight end Mike Vrabel reaches for a floating pass from Tom Brady in the end zone. Vrabel's touchdown grab put the Patriots up 14-7 in the third quarter. On defense, Vrabel's primary duties, he sacked Philadelphia Eagles quarterback Donovan McNabb for a 16-yard loss. The Patriots won 24-21. Pittsburgh Steelers wide receiver Hines Ward leaps in the end zone after catching a 43-yard touchdown pass from Antwaan Randle El. Randle El, a wide receiver who played quarterback in college, threw the pass after a wide receiver reverse that left Ward wide open. Ward led all receivers with 123 yards on five catches in the 21-10 win over the Seattle Seahawks. 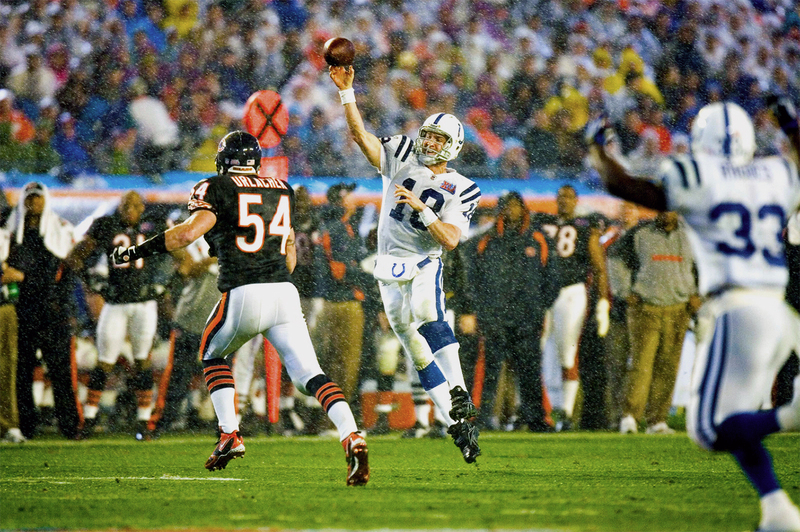 Indianapolis Colts quarterback Peyton Manning throws an off-balance pass against the Chicago Bears. Manning led the Colts to a 29-17 victory, giving him his only Super Bowl title. 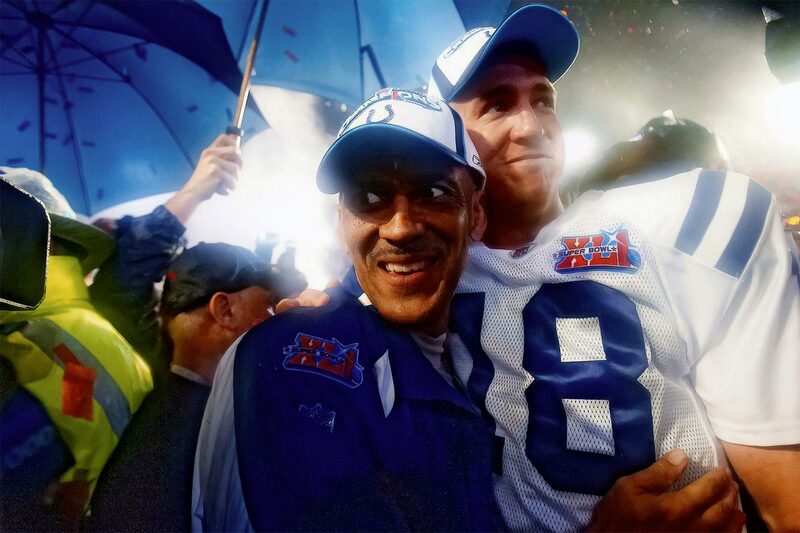 Indianapolis Colts head coach Tony Dungy and quarterback Peyton Manning smile together after defeating the Chicago Bears, 29-17. New York Giants wide receiver David Tyree somehow manages to hang on to the catch by pinning the ball against his helmet as New England Patriots safety Rodney Harrison hits him late in the fourth quarter. Tyree also caught a touchdown pass earlier in the fourth quarter that helped the Giants to their 17-14 victory. 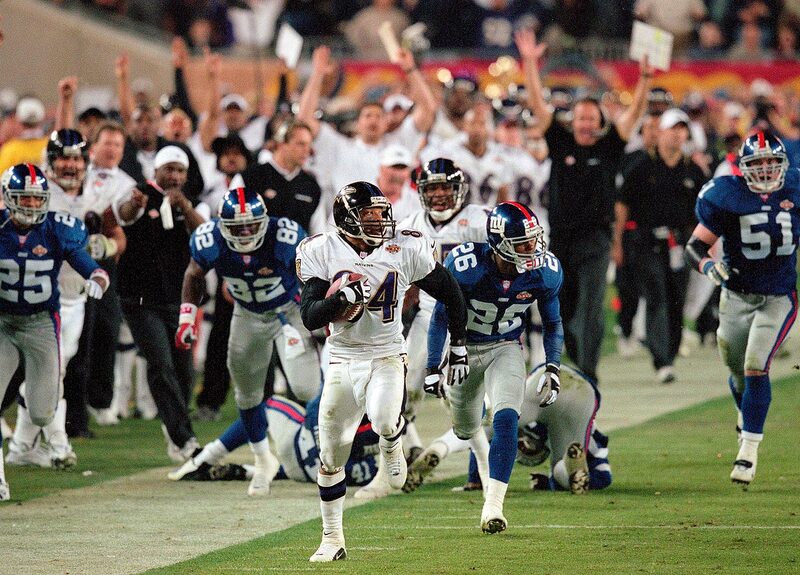 Plaxico Burress eyes the football as it floats in to him for the game-winning touchdown. The New York Giants wide receiver caught the pass from quarterback Eli Manning with 35 seconds left to upset the New England Patriots 17-14, ruining the Patriots' bid for a perfect season. 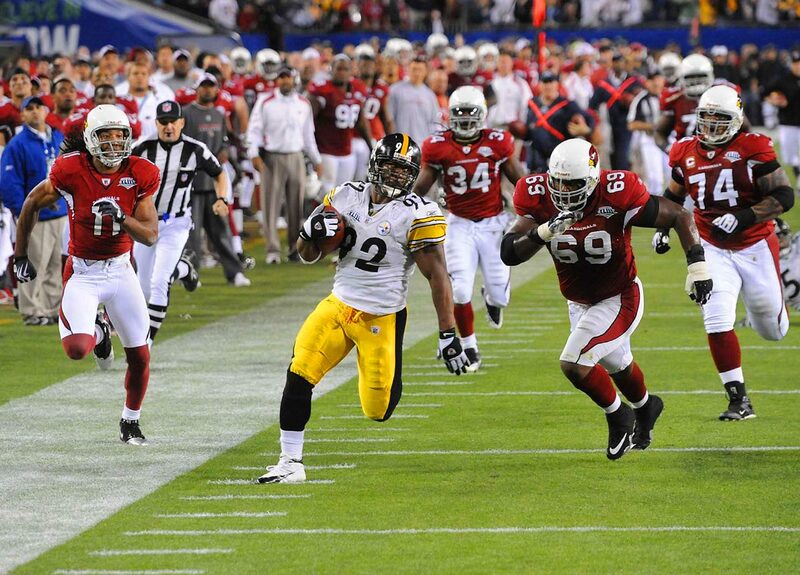 Pittsburgh Steelers linebacker James Harrison beats the Arizona Cardinals in a foot race as he returns a Kurt Warner interception 100 yards for a touchdown. 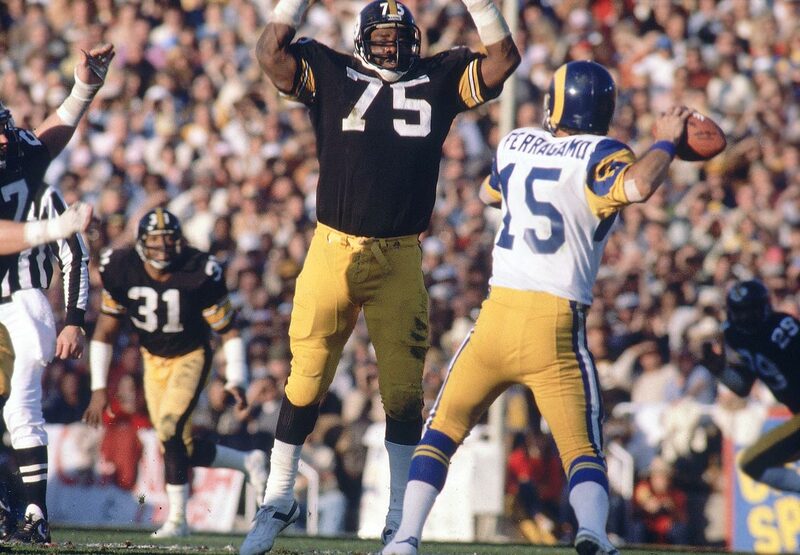 Harrison's interception return, which came on the last play of the second quarter, is the longest play in Super Bowl history and gave the Steelers a 17-7 halftime lead. Pittsburgh went on to win 27-23. Pittsburgh Steelers wide receiver Santonio Holmes gets both feet down in the back right corner of the end zone to score a game-winning touchdown as safety Aaron Francisco attempts to push him out of bounds. 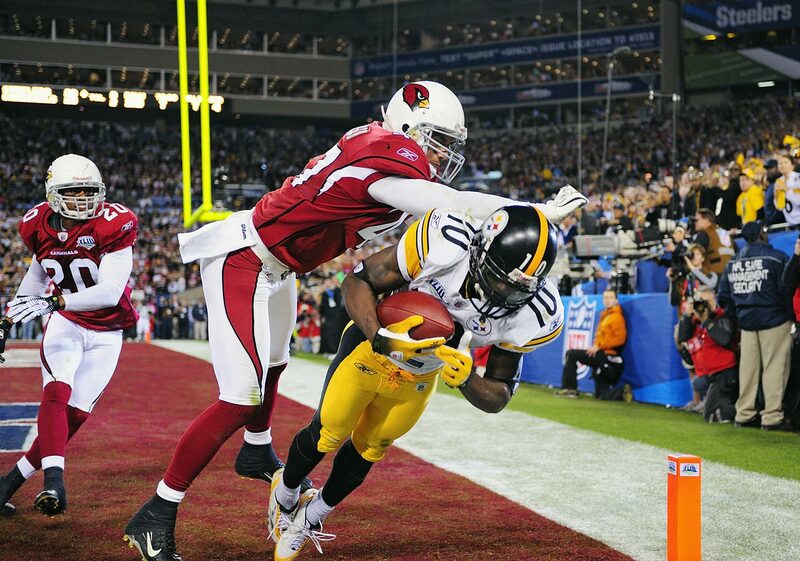 After Arizona had scored 16 consecutive points in the second half to take a 23-20 lead, Holmes pulled in this Ben Roethlisberger pass with 35 seconds left to lift the Steelers to the 27-23 win. New Orleans Saints running back Pierre Thomas dives into the end zone in the third quarter. Thomas gained 85 total yards against the Indianapolis Colts, including 55 receiving yards on six catches in the 31-17 Saints' win. Tracy Porter races with his interception return, taking it 74 yards for a touchdown. The New Orleans cornerback picked off Indianapolis Colts quarterback Peyton Manning, and his score iced the Saints' 31-17 win. New Orleans Saints quarterback Drew Brees holds up his son Baylen as his wife Brittany looks on after the Saints' 31-17 win over the Indianapolis Colts. The victory was the first Super Bowl title for New Orleans and came just four years after Hurricane Katrina decimated the city and forced the Saints out of the Superdome for a year. Green Bay Packers safety Nick Collins gets into the end zone to complete his interception return in the first quarter. Collins' pick was part of a hot start for the Packers against the Pittsburgh Steelers as Green Bay built leads of 14-0 and 21-3 before winning 31-25. Green Bay Packers cornerback Charles Woodson breaks up a pass intended for Pittsburgh Steelers wide receiver Mike Wallace. Woodson broke his collarbone on the play and did not return. The Packers won 31-25. New York Giants wide receiver Mario Manningham barely gets both feet down in bounds on a 38-yard reception that set up the New York's game-winner in a 21-17 game. Manningham caught five passes for 73 yards against the New England Patriots. New York Giants running back Ahmad Bradshaw tries to stop himself from falling into the end zone but his forward momentum carries him in during New York's 21-17 victory over the New England Patriots. Baltimore Ravens wide receiver Anquan Boldin makes a back-shoulder catch against San Francisco 49ers cornerback Carlos Rogers. 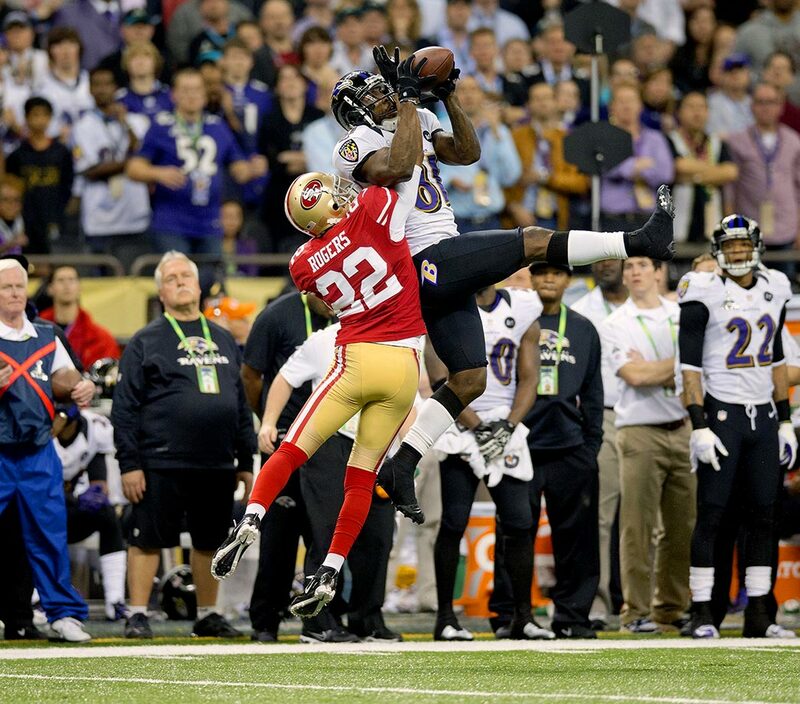 Boldin caught six passses for 104 yards and a touchdown in the Ravens' 34-31 win. 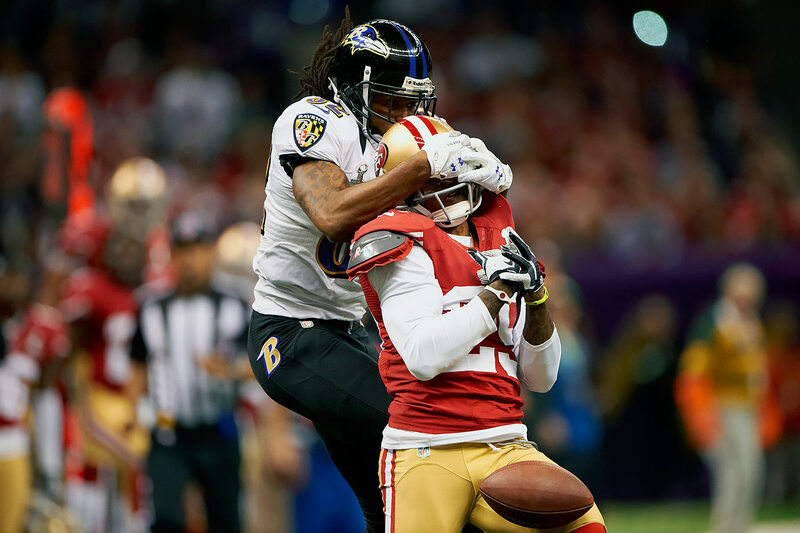 Baltimore Ravens wide receiver Torrey Smith turns into a defender to try to keep San Francisco 49ers cornerback Chris Culliver from making an interception. Ravens quarterback Joe Flacco's three touchdown passes and zero interceptions helped lead Baltimore to a 34-31 victory. 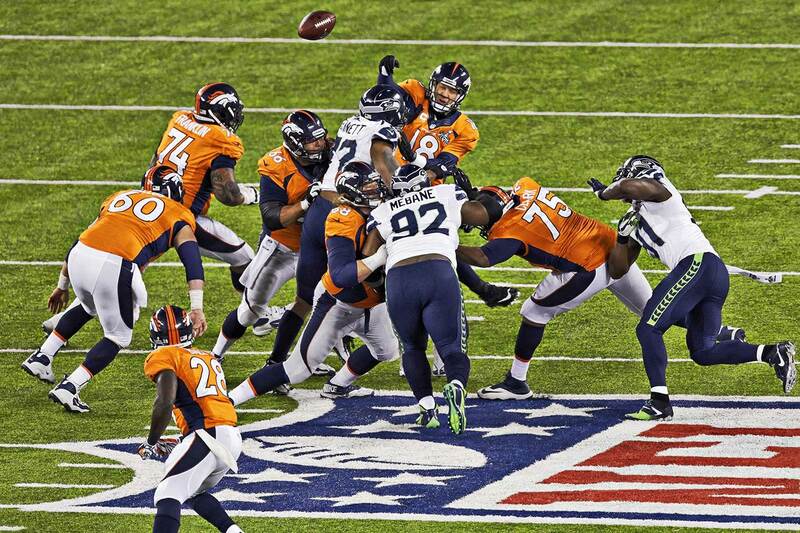 Denver Broncos quarterback Peyton Manning fumbles after a sack by Seattle Seahawks defensive end Michael Bennett. It was one of four Broncos turnovers on the night as Seattle dominated Denver, 43-8. 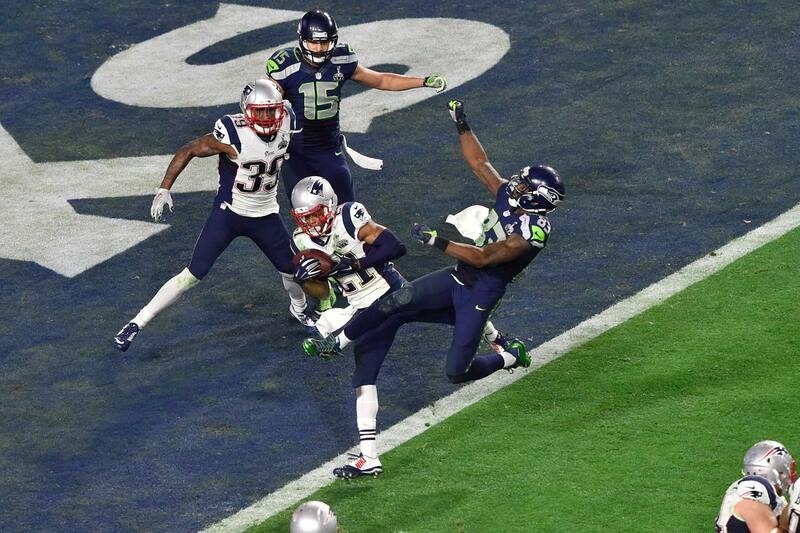 New England Patriots cornerback Malcolm Butler intercepts a pass intended for Seattle Seahawks wide receiver Ricardo Lockette on 2nd and goal with 26 seconds left in the game. Butler took the ball, and the game, away. The Pats won 28-24. Denver Broncos defensive end Malik Jackson and linebacker DeMarcus Ware dive for the ball fumbled by Carolina Panthers quarterback Cam Newton during the first half. Jackson recovered the fumble for the Broncos' first touchdown in their 24-10 victory. Denver Broncos quarterback Peyton Manning runs upfield after completing a first down pass against the Carolina Panthers in the third quarter. Manning finished 13-for-23 for 141 yards against a strong Carolina defense in Denver's 24-10 win, and he became the first quarterback to win Super Bowls with two franchises. Atlanta Falcons wide receiver Julio Jones makes a leaping catch over New England Patriots defensive back Eric Rowe late in the fourth quarter. Up 28–3 in the third quarter, the Falcons lost to the Patriots in overtime, 34-28. New England Patriots wide receiver Malcolm Mitchell signals touchdown with an official after running back James White's two-yard run in overtime to defeat the Atlanta Falcons, 34-28. The Patriots pulled themselves out of a 25-point hole against the Falcons to a 34-28 win for New England's fifth NFL championship. 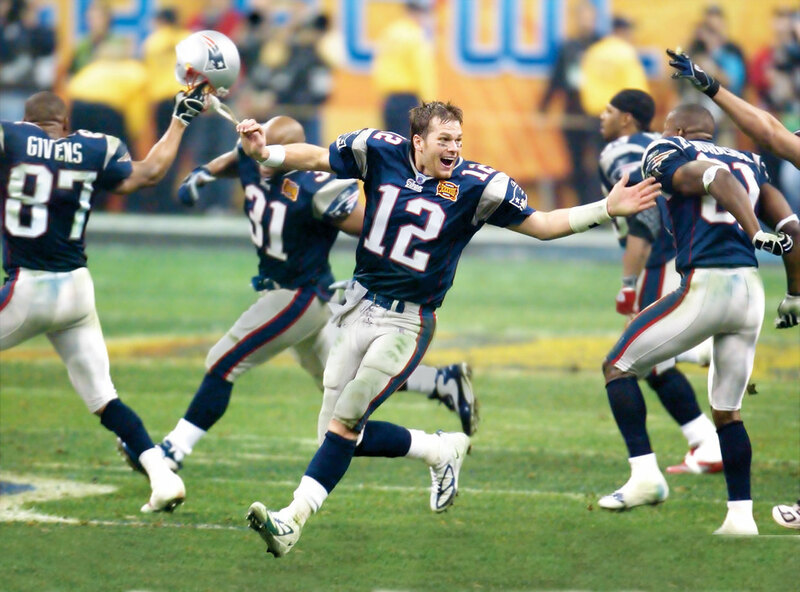 It was the first Super Bowl decided in overtime.